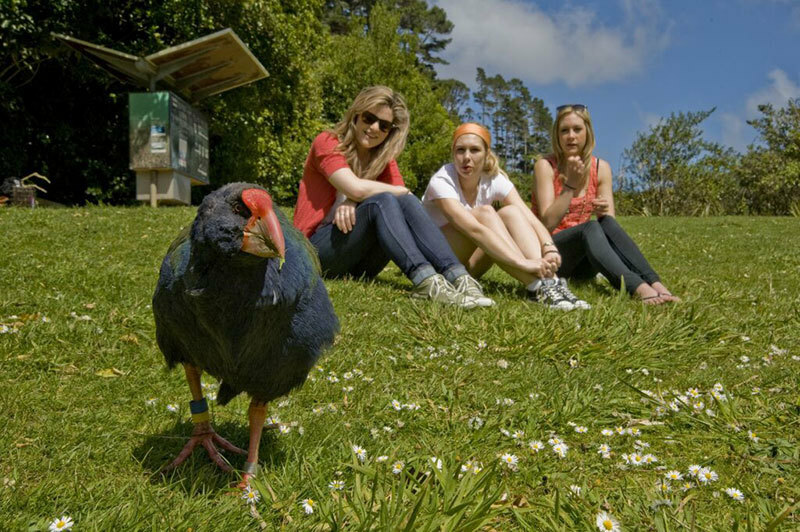 North & South Island Self Drive for the First Time Visitor. 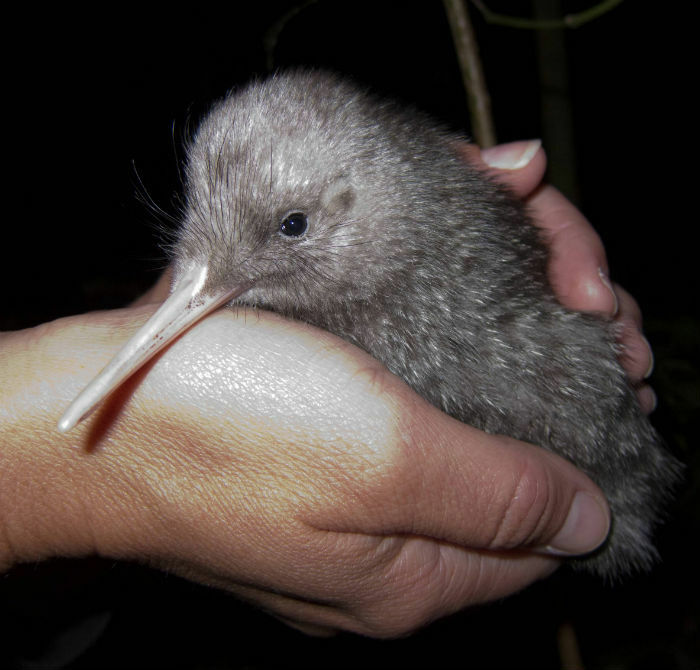 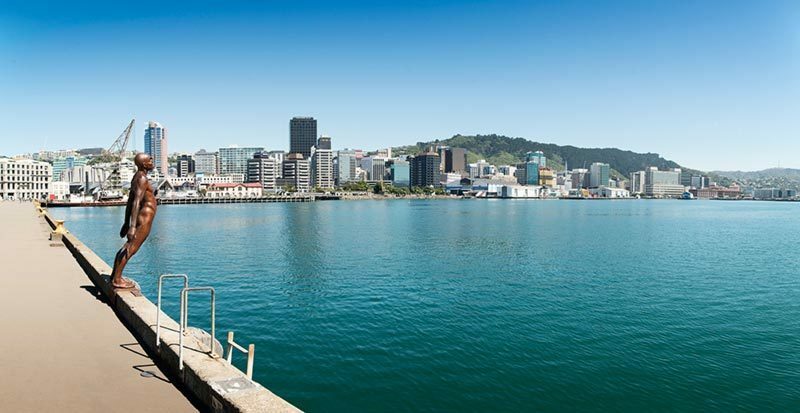 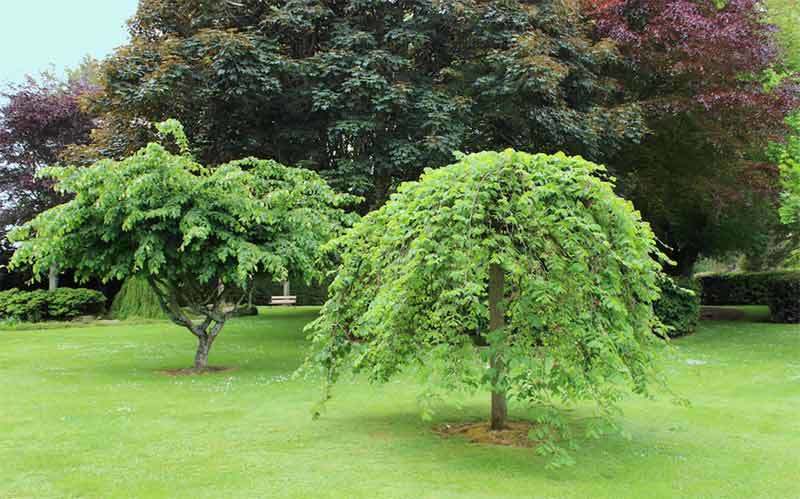 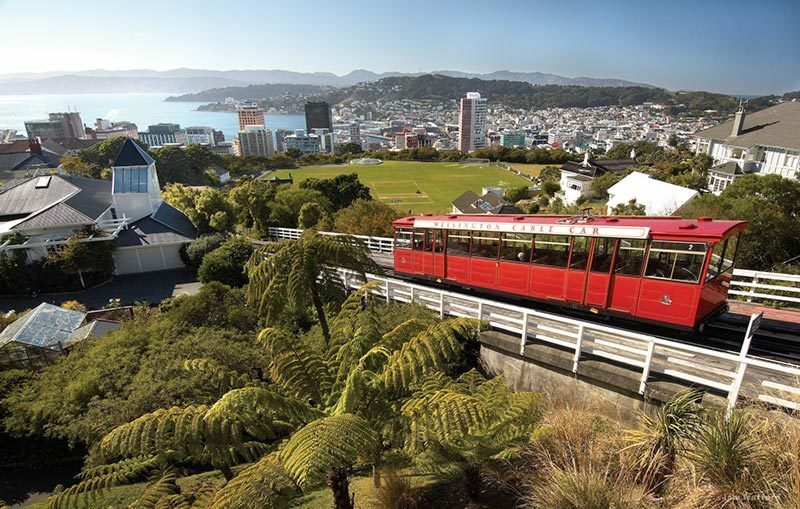 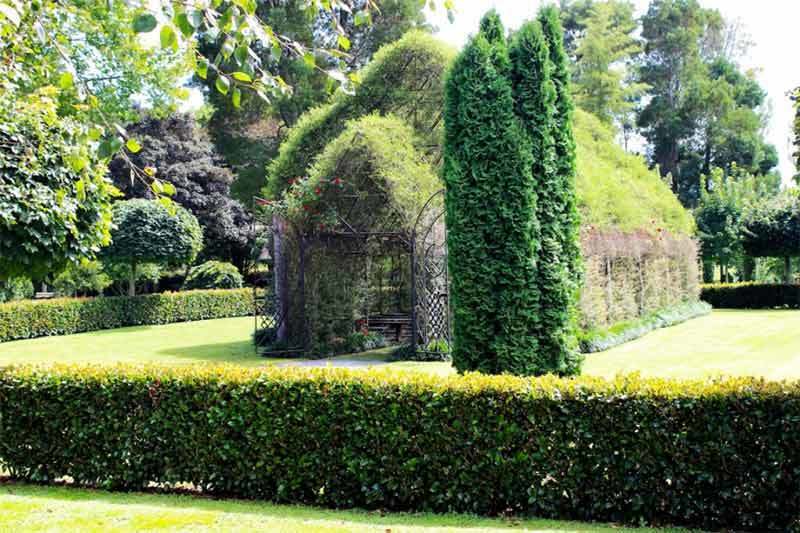 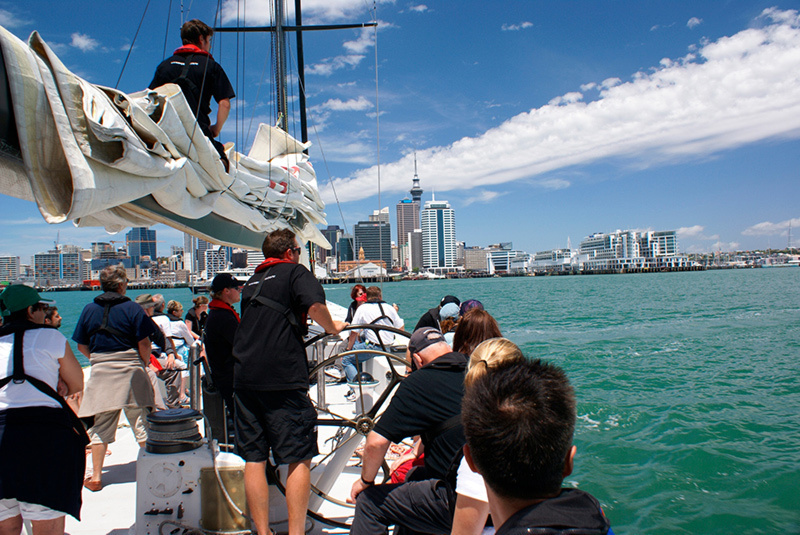 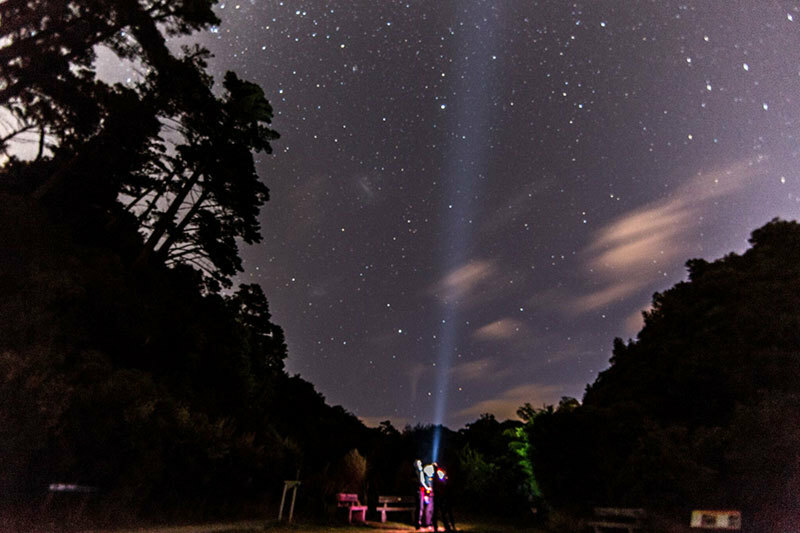 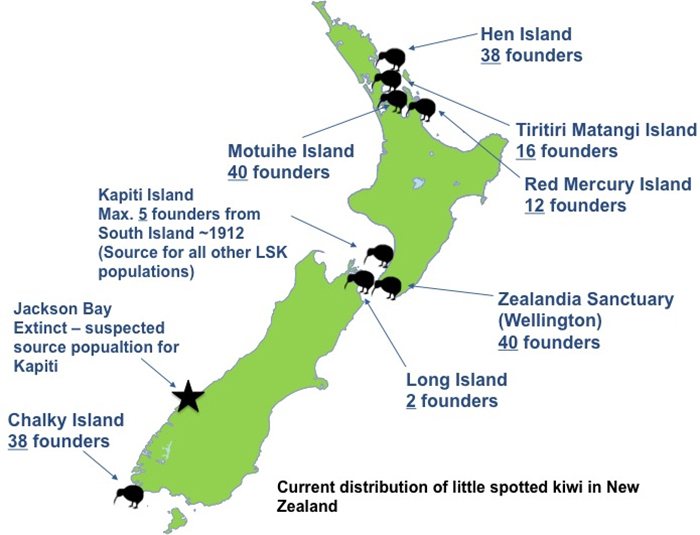 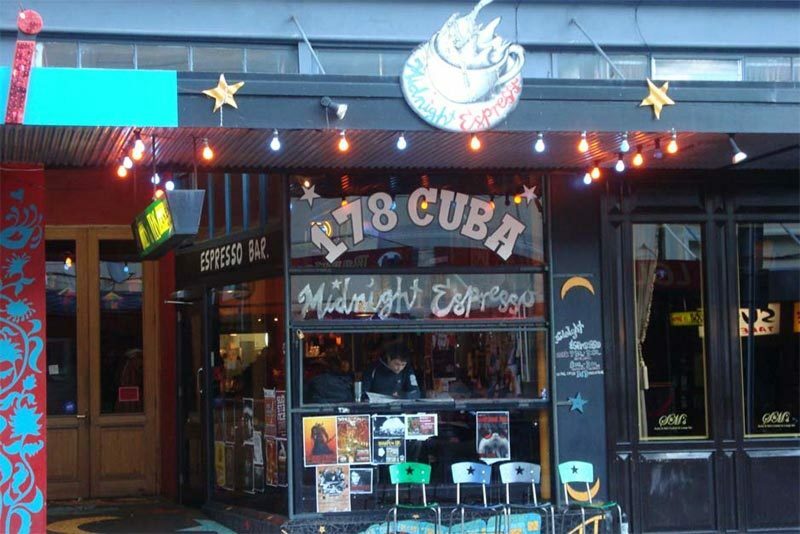 Auckland ◦ Waitomo Caves ◦ The Tongariro Crossing ◦ Weka Workshops Wellington ◦ Ferry North Is to South Is via The Marlborough Sounds ◦ Premier wine growing region, Marlborough ◦ Abel Tasman National Park. 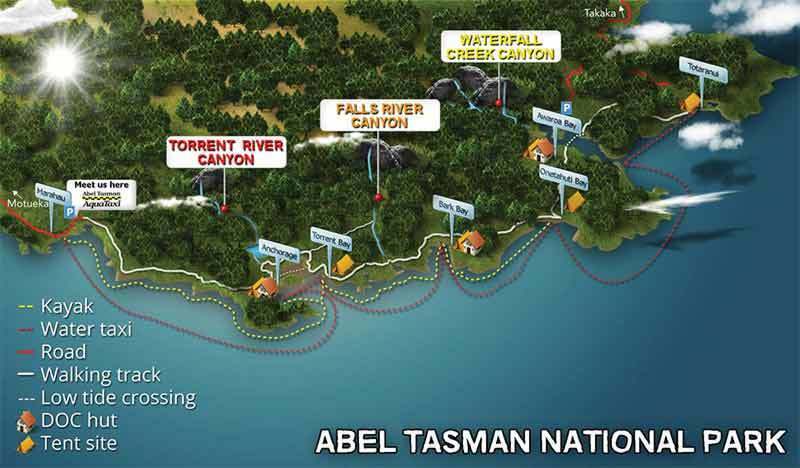 This will be a long day of driving, but with many interesting activities to enjoy along the way. 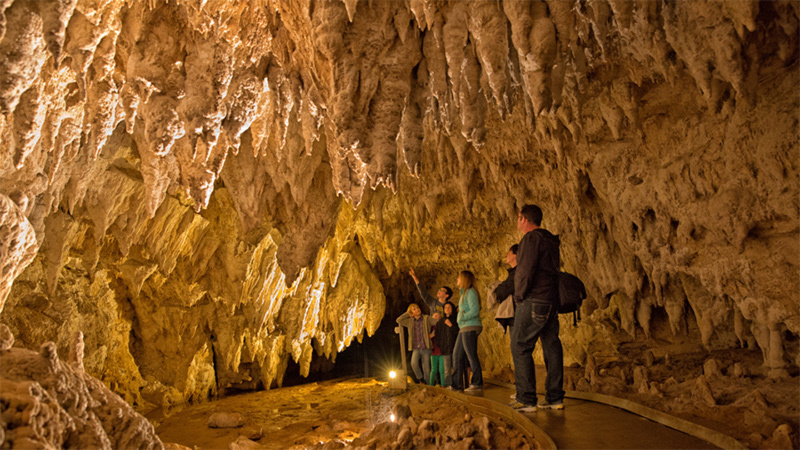 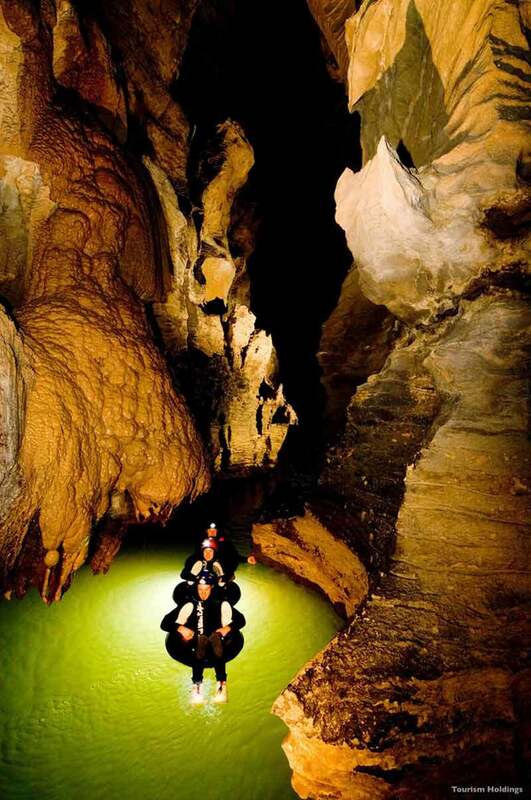 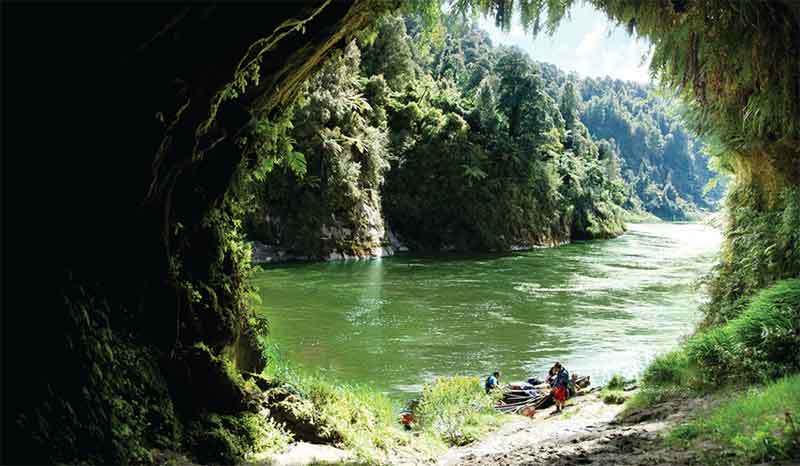 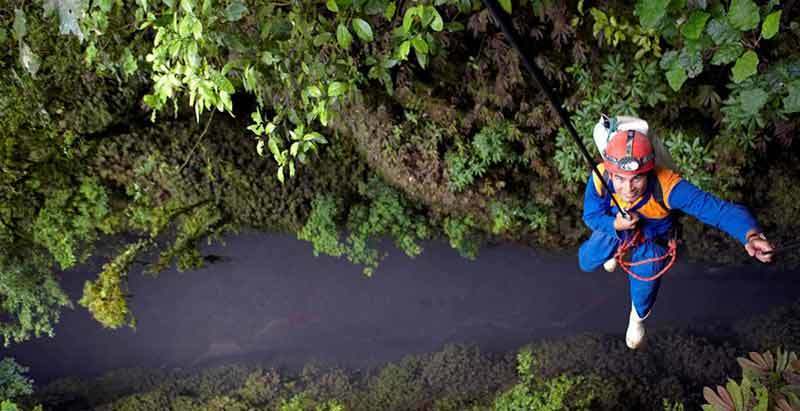 The highlight for most will be the world famous Waitomo Caves. 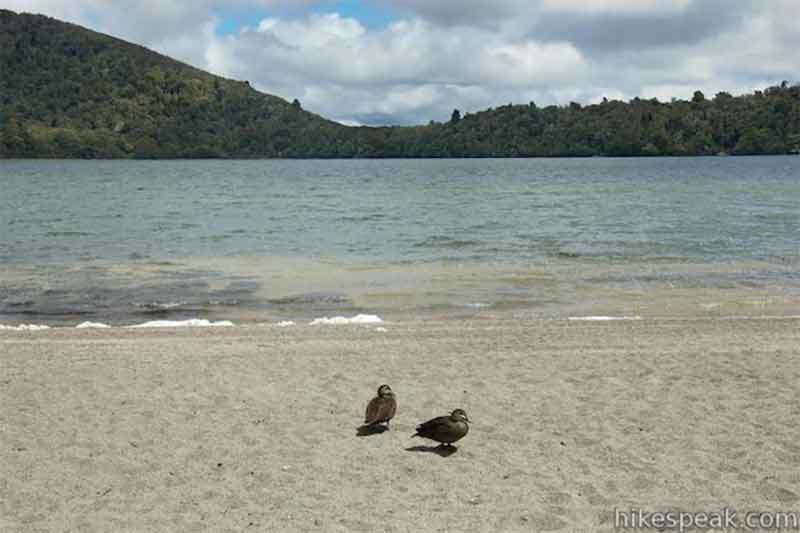 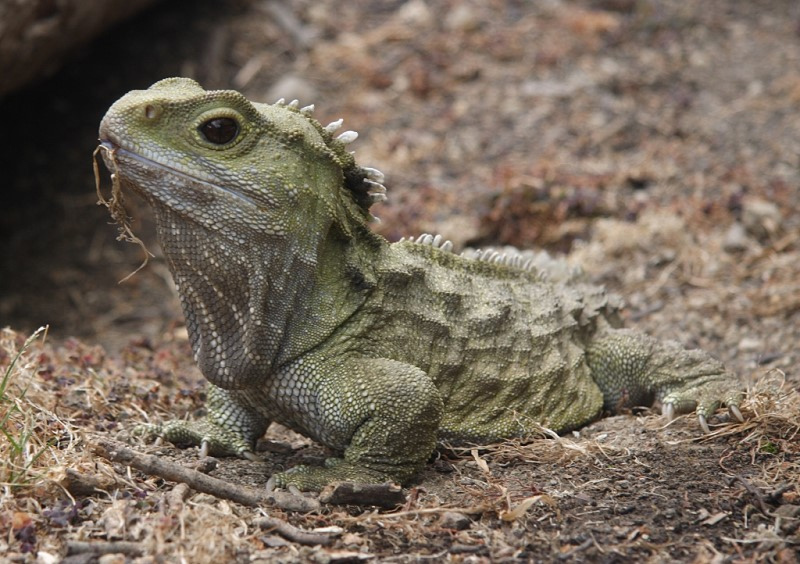 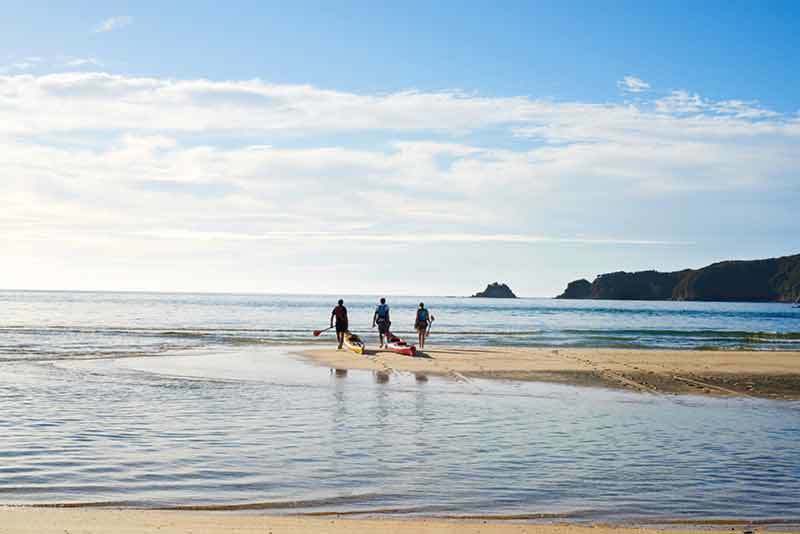 A great start to your self drive North Island tour. 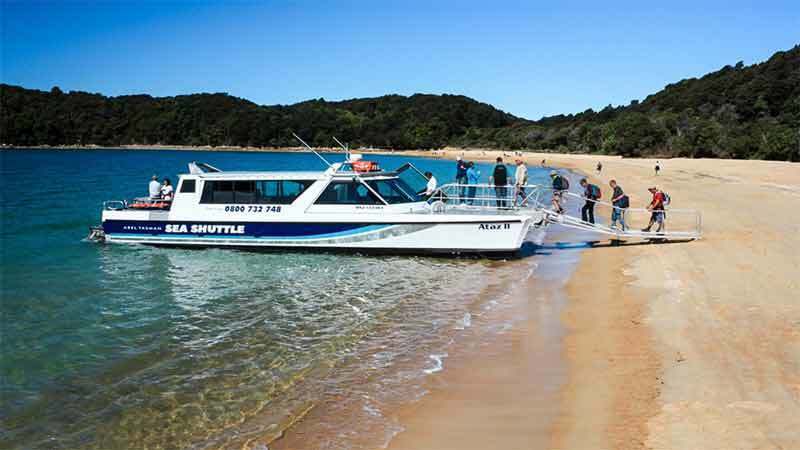 This is a 3 to 4 hour ferry trip, carrying both passengers and vehicles, with several sailings a day. 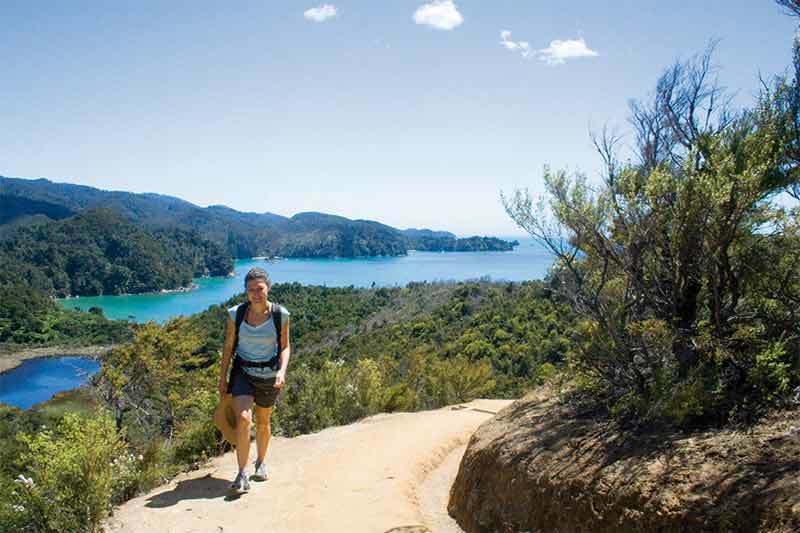 Most of the journey is within Wellington Harbor and in the South Island, the beautiful Marlborough Sounds. 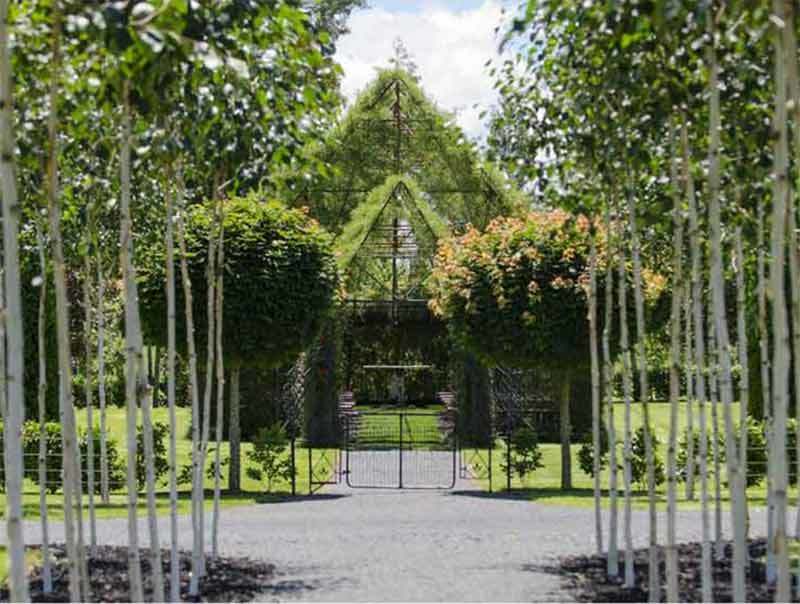 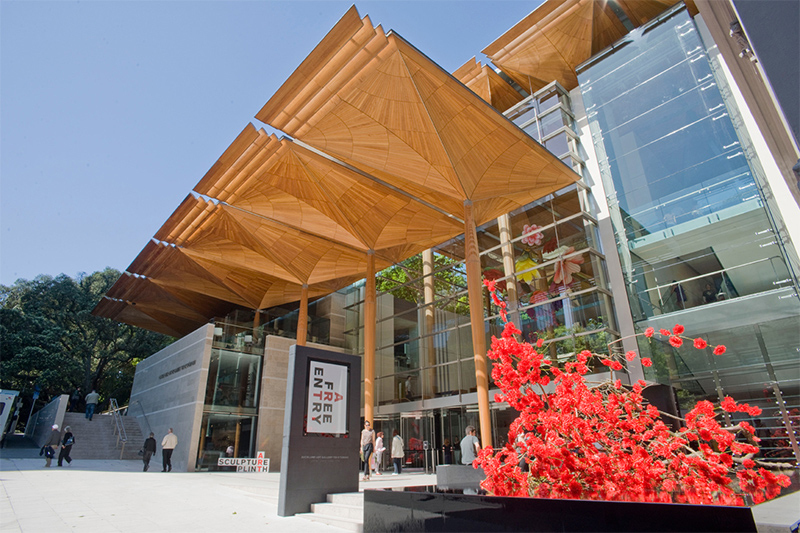 The arrival and departure terminal in the South Island is Picton, just 20 minutes away from Blenheim and the wine growing region of Marlborough. 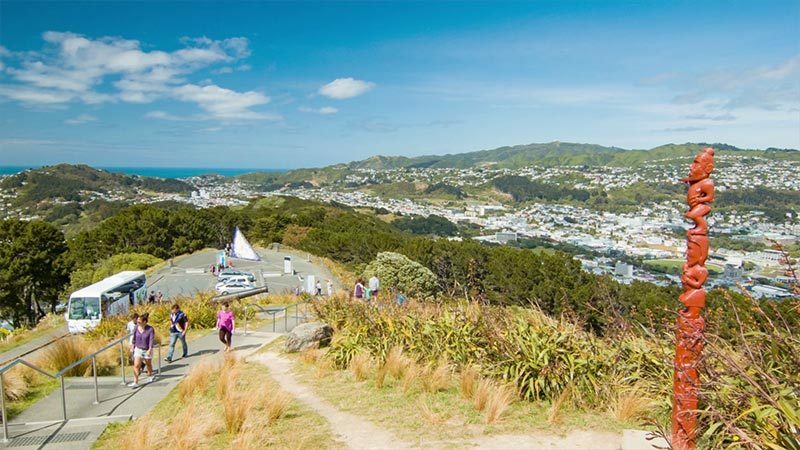 Picton is also at the start of what many regard as New Zealand's most scenic drive, the Queen Charlotte Sound Drive and within 2 hours the city of Nelson and the Abel Tasman National Park. 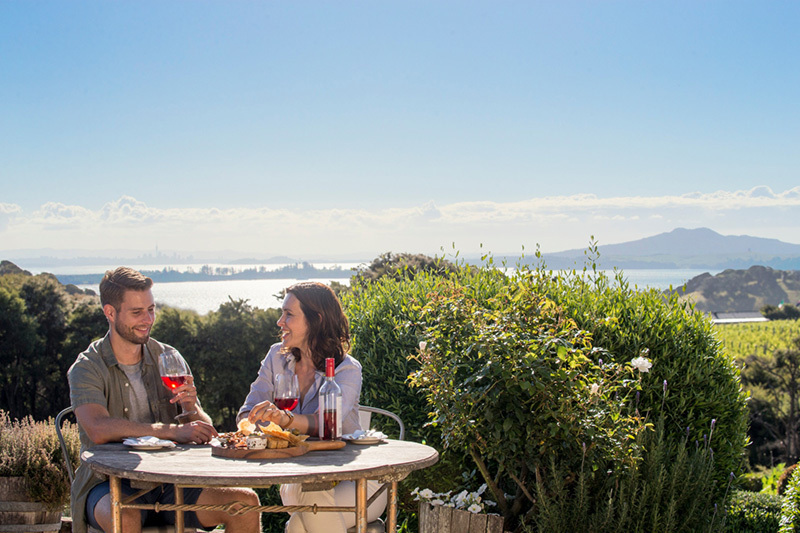 Blenheim lies at the heart of Marlborough, the wine-growing region that first brought New Zealand wines to the attention of serious wine lovers from around the world. 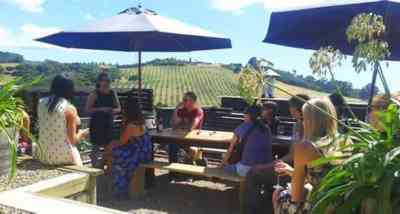 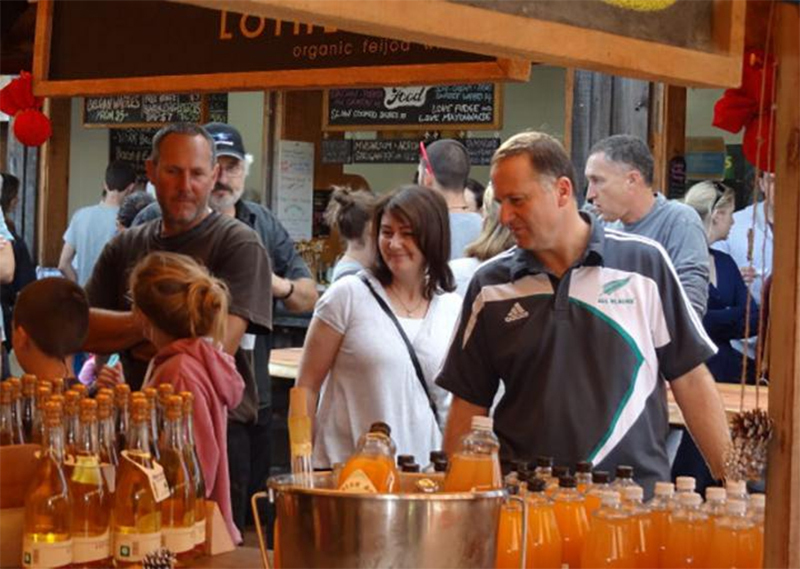 There are more than 20 wineries within driving distance of the town, and most of them welcome visitors for sampling sessions and cellar door sales. 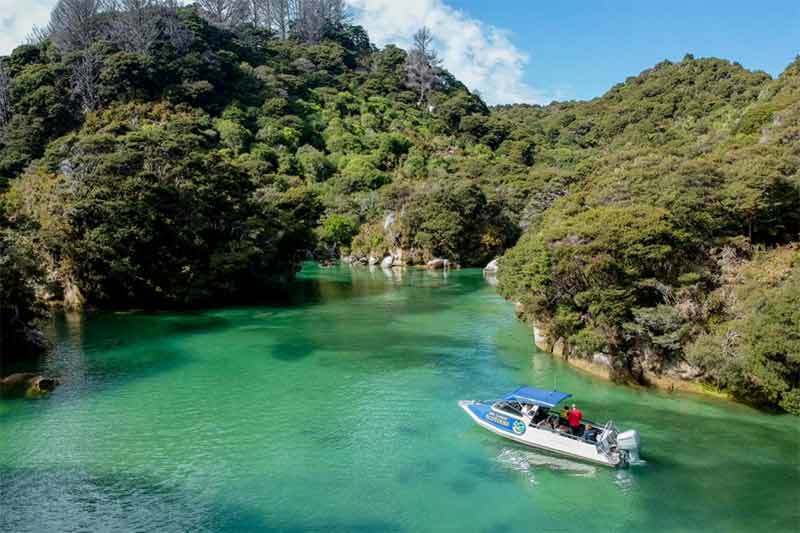 Today will be a highlight of your New Zealand vacation as you drive north to Picton where you join the wonderful Queen Charlotte Sound Drive, one of the most scenic drives in the country. 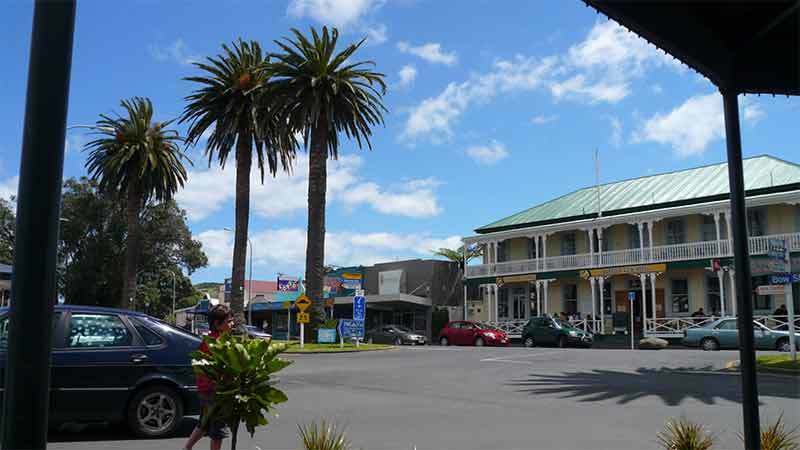 The rural town of Motueka is ideally located as a setting off point for the many attractions of the Nelson and Golden Bay regions. 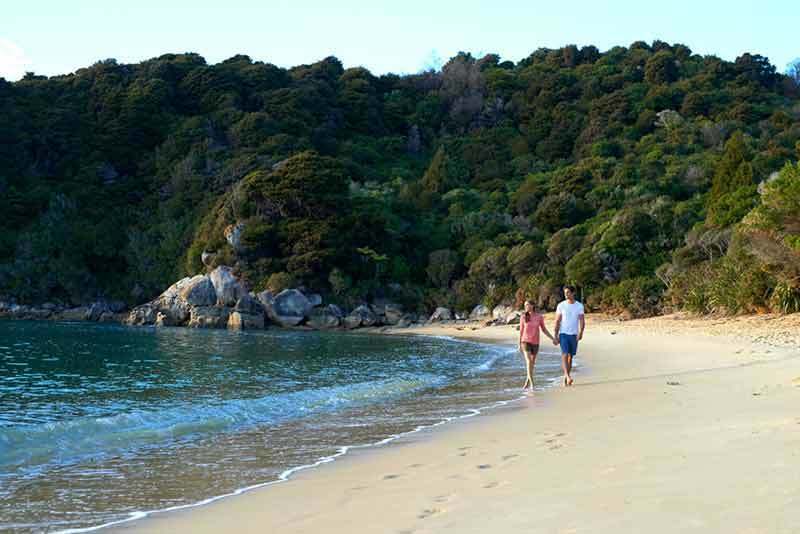 The most well known attraction is the nearby Abel Tasman National Park, just a 15 minute drive away. 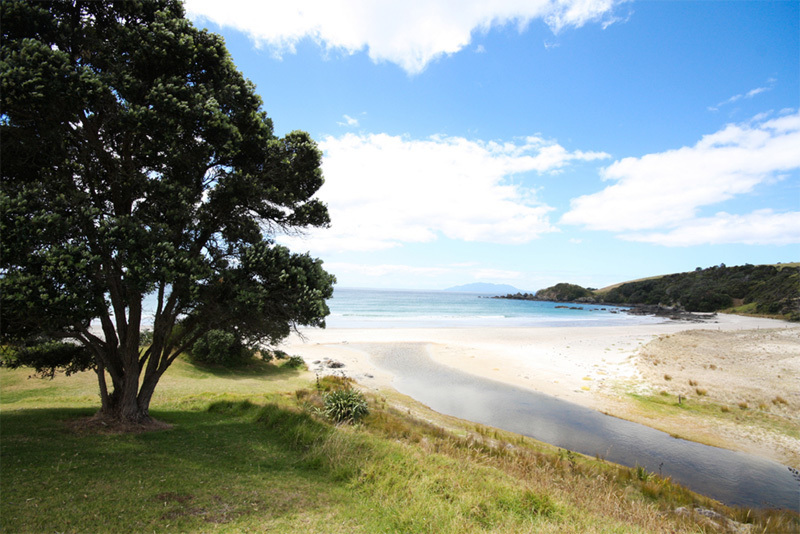 See also - We've Just Purchased a Beach! 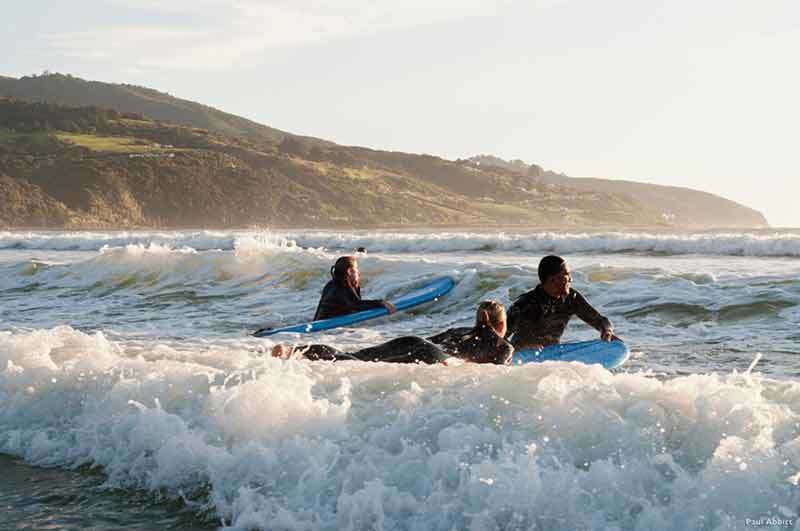 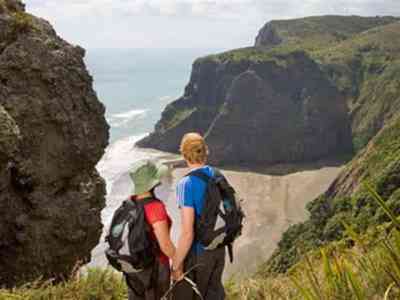 If you depart from Auckland nice and early you'll have time to include a drive of one hour round-trip to the colorful seaside town of Raglan, the place made famous by film-maker Bruce Brown in his legendary surfing documentary 'The Endless Summer' A must-do for anyone with even the vaguest connection with surfing. 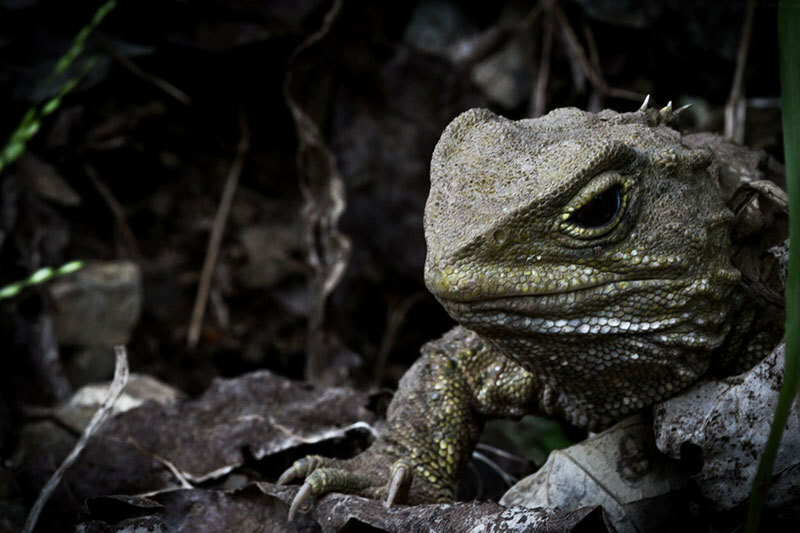 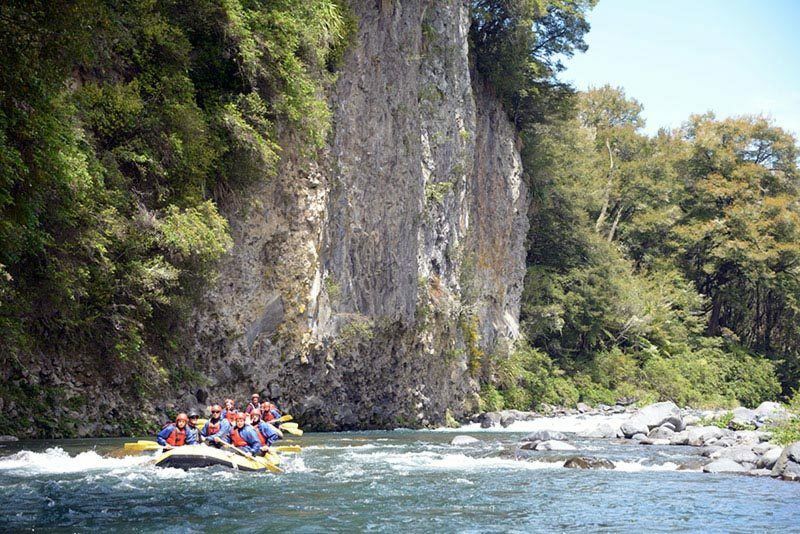 We have a blog about our visit to Raglan here. 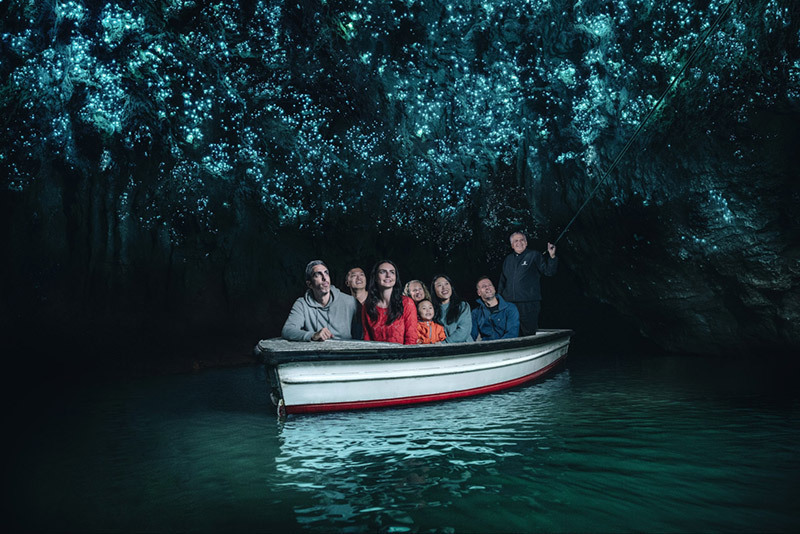 The Black Abyss is the ultimate Waitomo adventure, the caving tour of choice for natural born adrenaline junkies and those who want to experience the thrill of an amazing underground adventure. 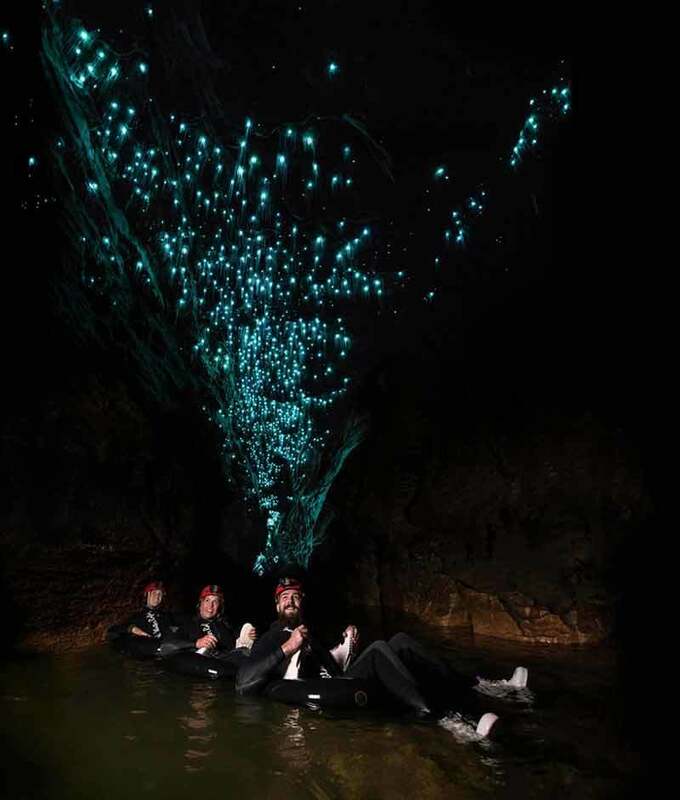 It starts with a descent into the seemingly bottomless black depths of the glow worm studded Ruakuri Cave. 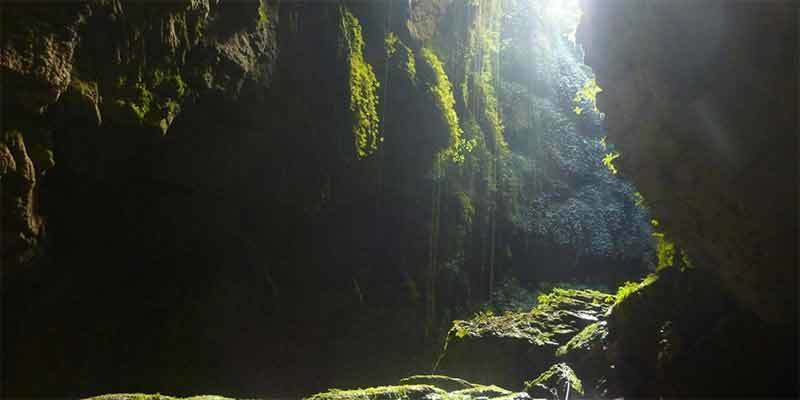 This next five hours will be an expedition that combines abseiling the 35 metre 'tomo', some climbing, whizzing down a flying fox and then cave-tubing underneath brilliant glow worm canopies. 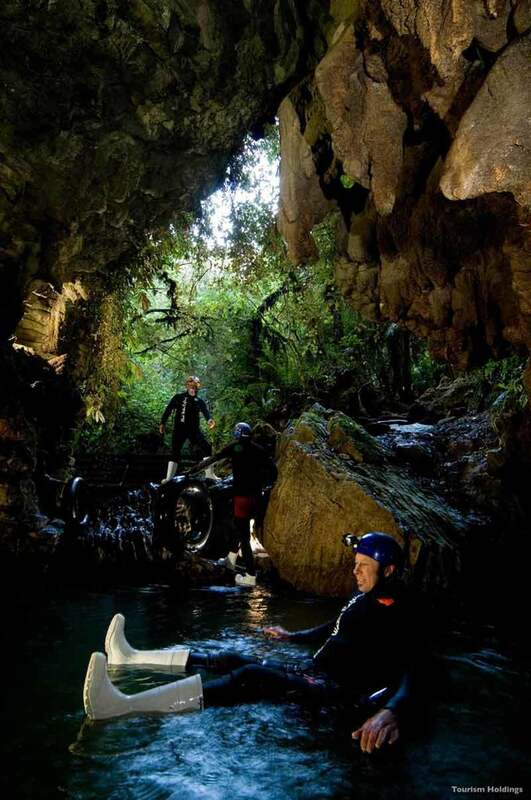 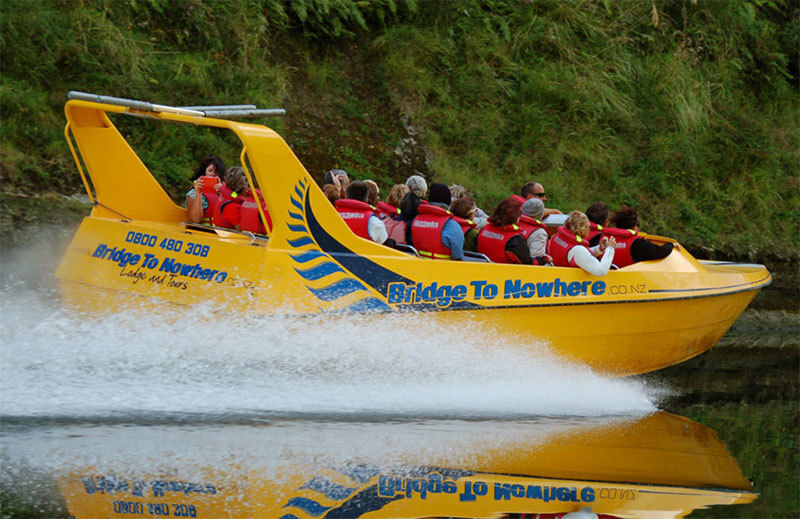 An unforgettable journey of the very best that Waitomo has to offer. 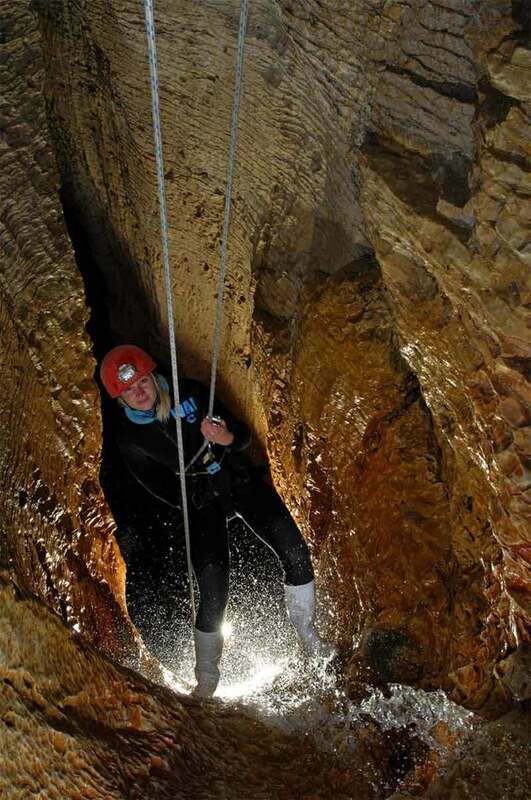 At every stage you're accompanied and supported by experienced caving guides from 'The Legendary Black Water Rafting Co.' who know nearly every square inch of this environment, one that is unique to the world. 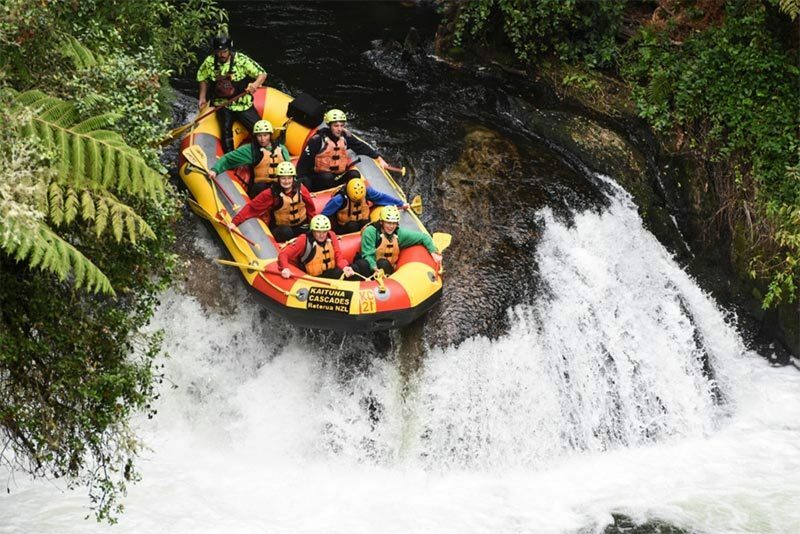 To quote a colleague who completed the Black Water Abyss "This was the most amazing adventure of my New Zealand vacation. 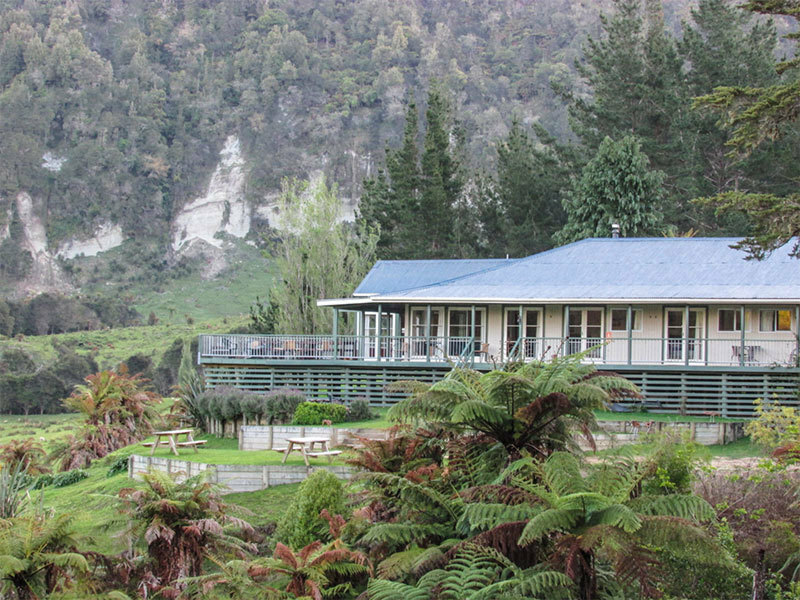 I was still bouncing off the walls several weeks later at the memory of it all"
No other New Zealand winery has played such an important role in establishing Marlborough and New Zealand's reputation for producing some of the world finest wines, especially Sauvignon Blanc. 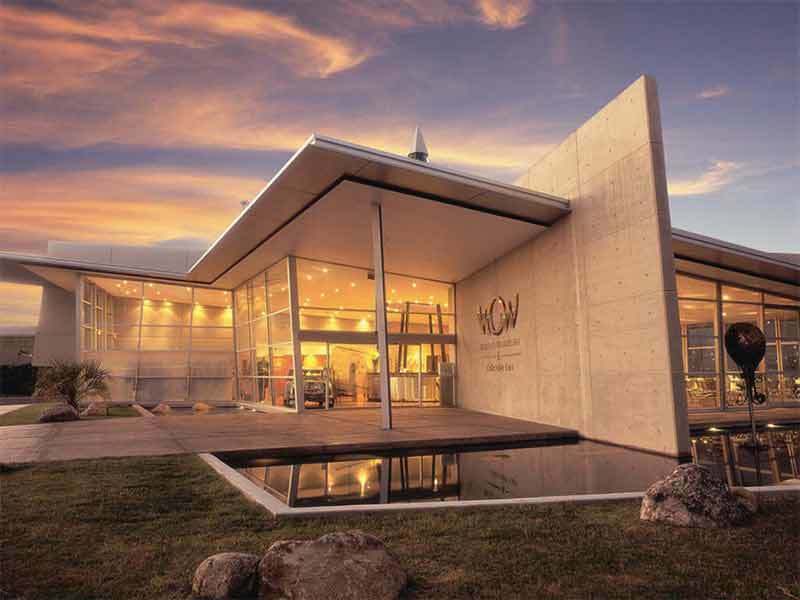 Now owned by the French company Louis Vuitton Moet Hennessy, this vineyard offers visitors a stylish and enjoyable tasting experience. 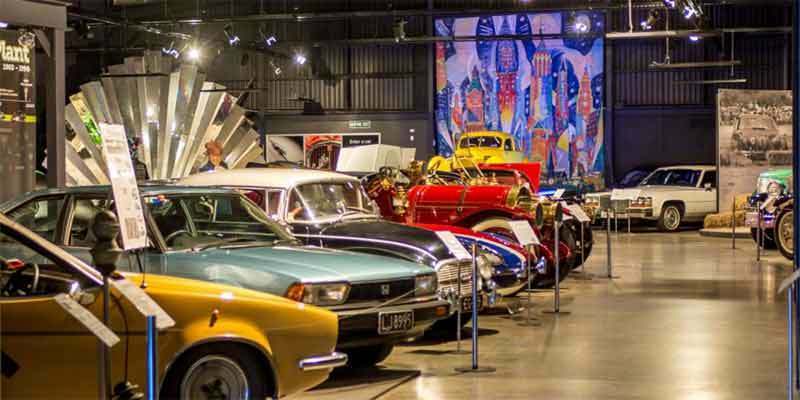 Working quietly behind the scenes, movie director Sir Peter Jackson and a small group dedicated enthusiasts created the Omaka Aviation Heritage Centre situated just a 10 minute drive from Blenheim. 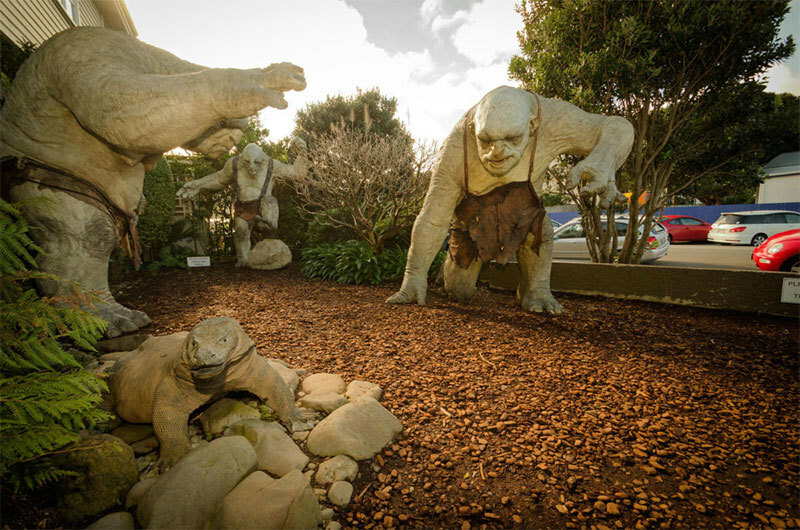 The Knights of the Sky exhibition, features Sir Peter Jackson’s own collection of World War 1 aircraft and rare artifacts. 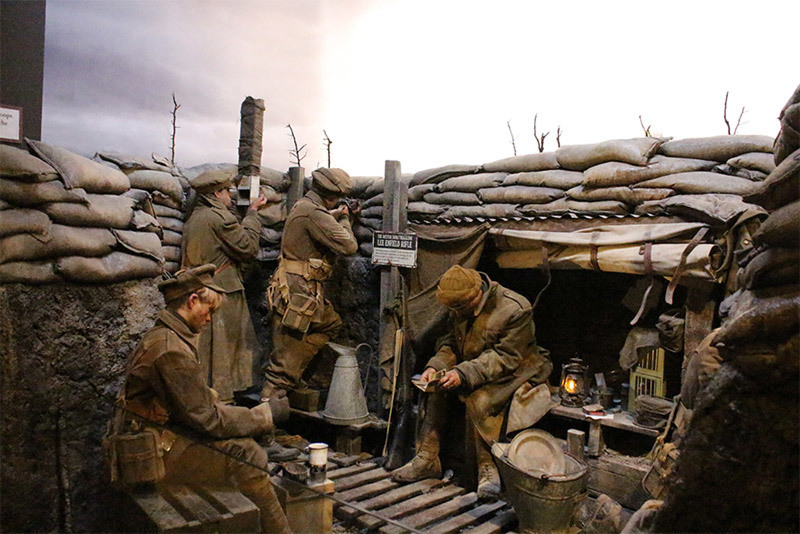 The story of aviation in the Great War of 1914-18 is brought to life in sensational sets, lovingly created by the combined talents of WingNut Films and the Weta Workshop. 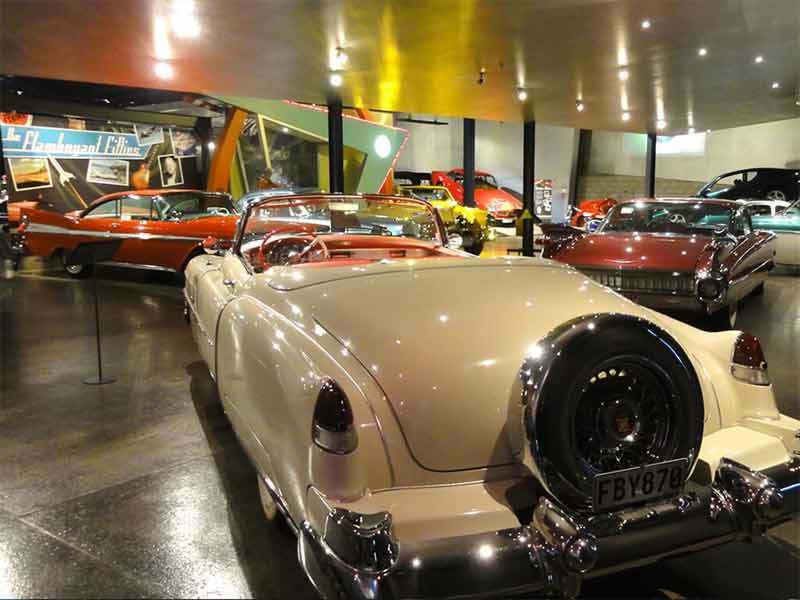 A 'must do' for anyone with an interest in history. 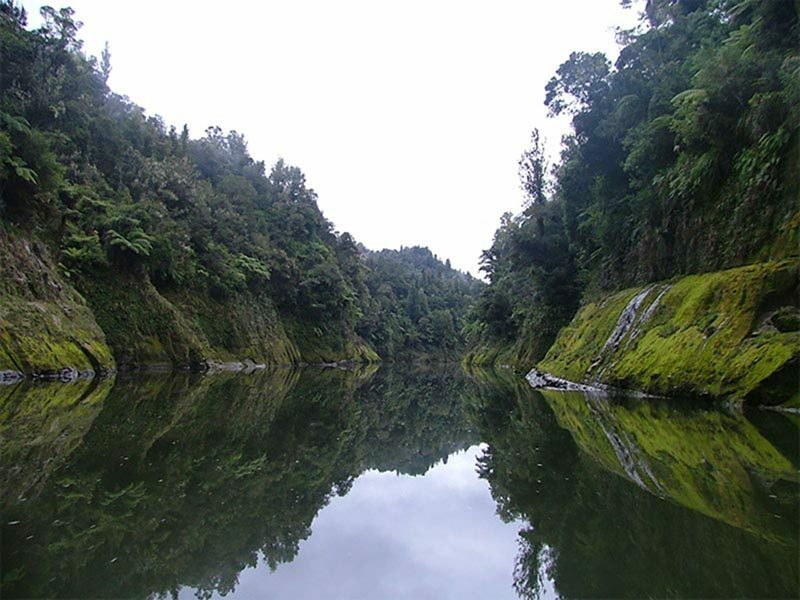 A nice and early start is recommended for todays spectacular drive, there's a lot to see and do, especially on the road between Picton and Havelock. 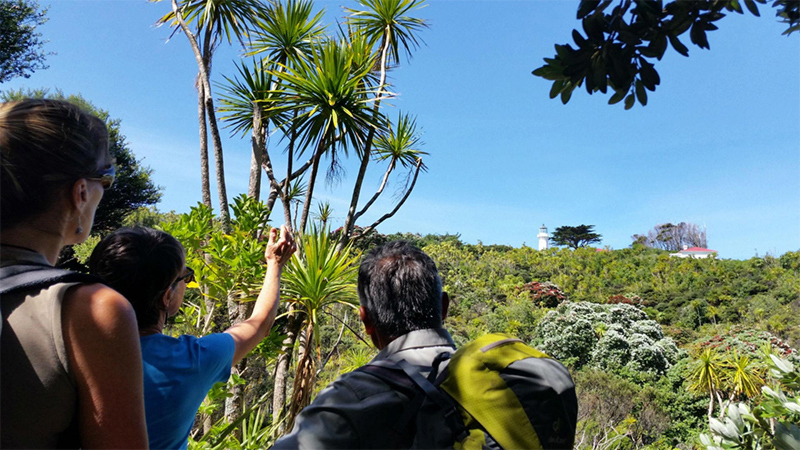 Stop at the lookout near the Havelock end of the road for breathtaking views. 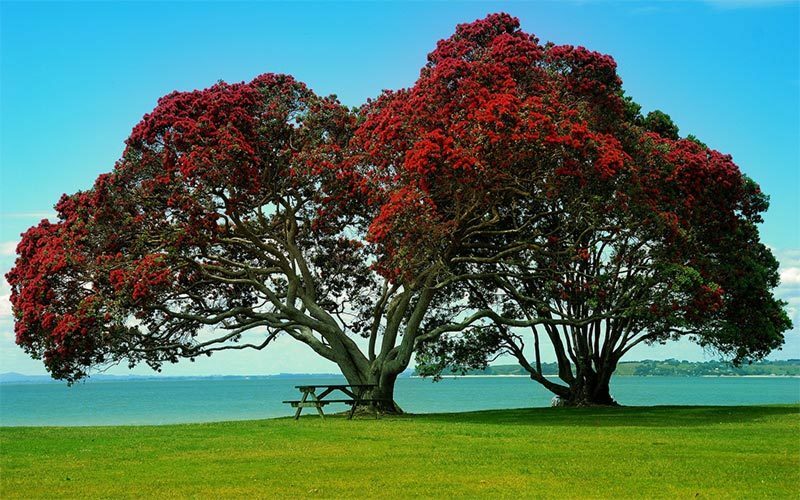 Parts of todays drive encounters some sharp and twisting turns but proceed carefully and you will be well rewarded with a most enjoyable day. 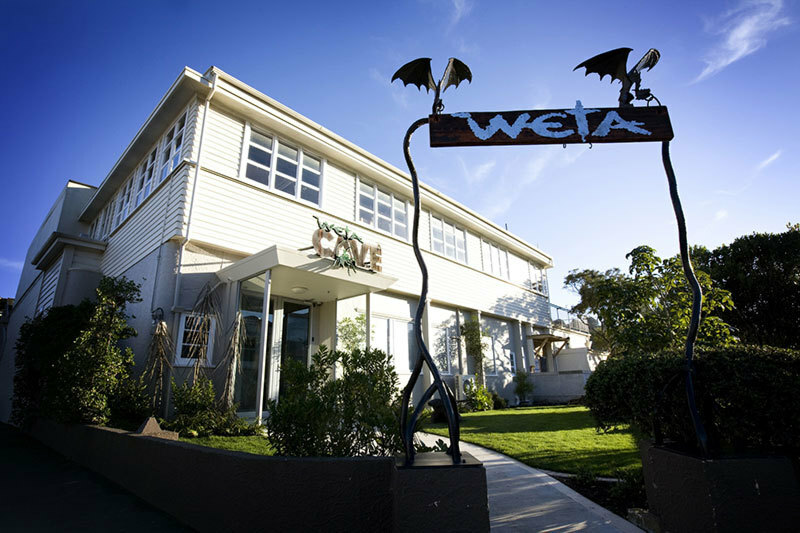 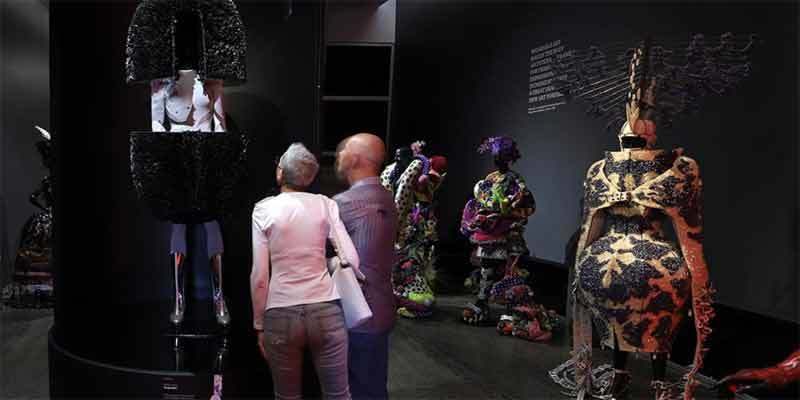 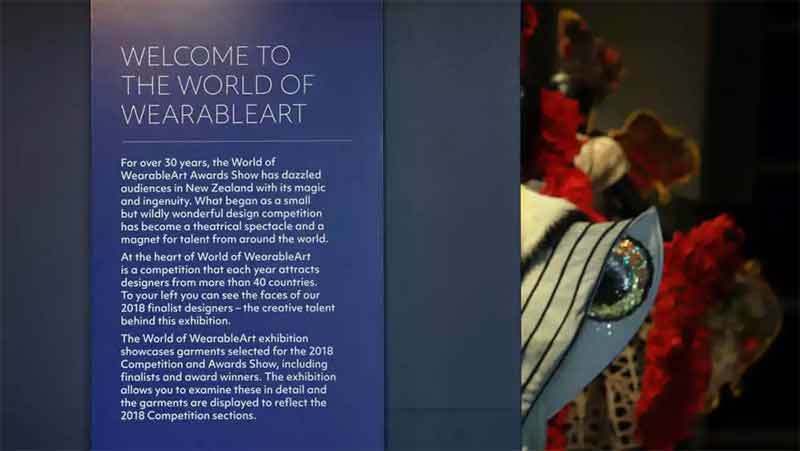 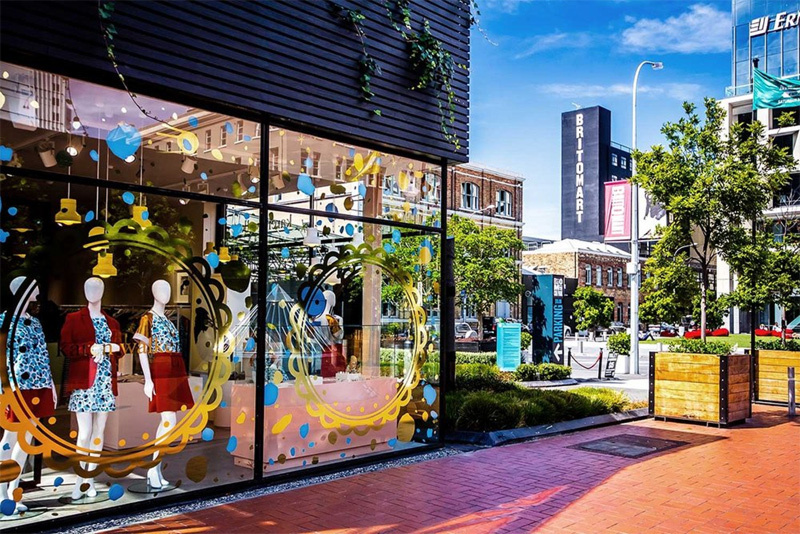 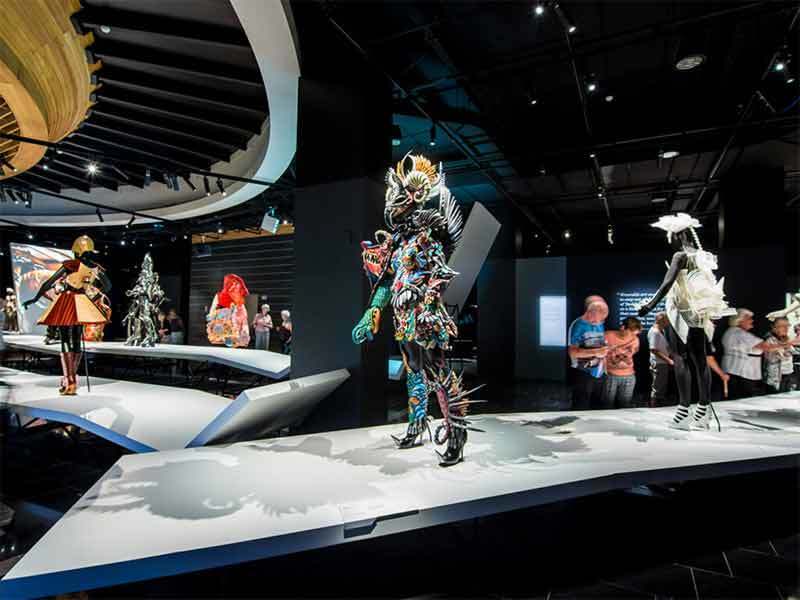 Only a minute off the road to Motueka this gallery displays 60 World of WearableArt award-winning creations submitted for competition by designers from all over the world. 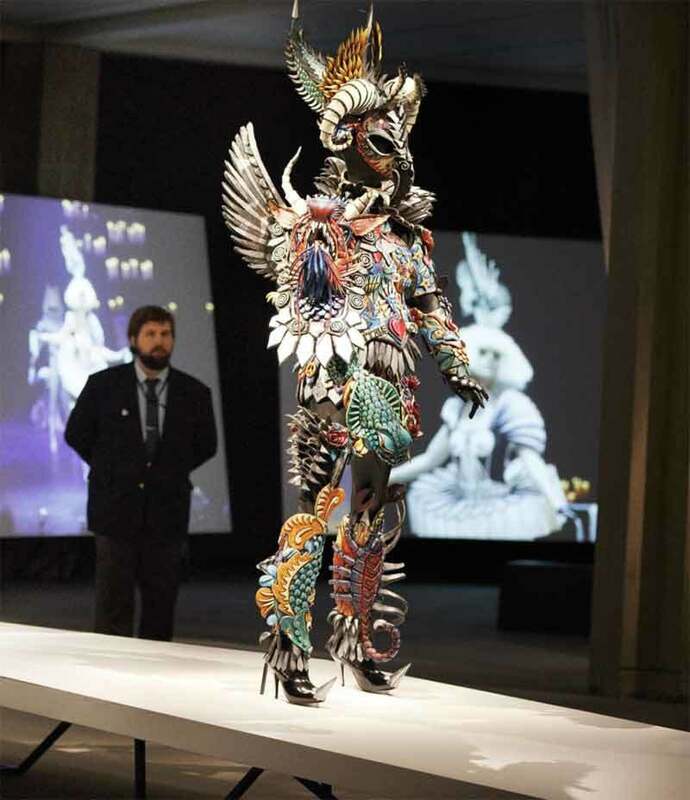 Anyone with even the slightest interest in fashion and design will be thrilled by what they experience here. 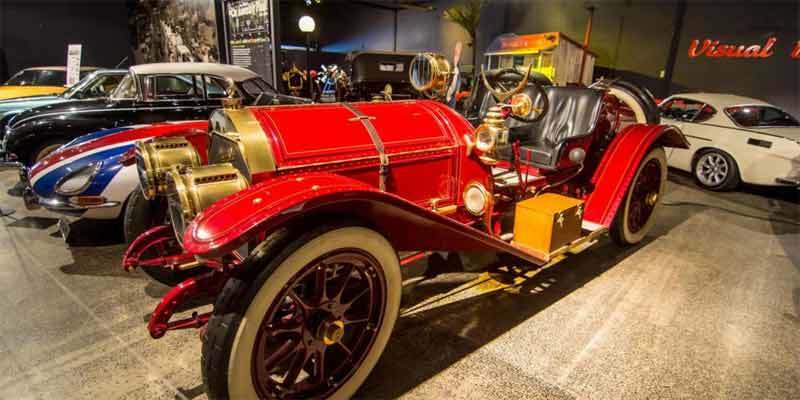 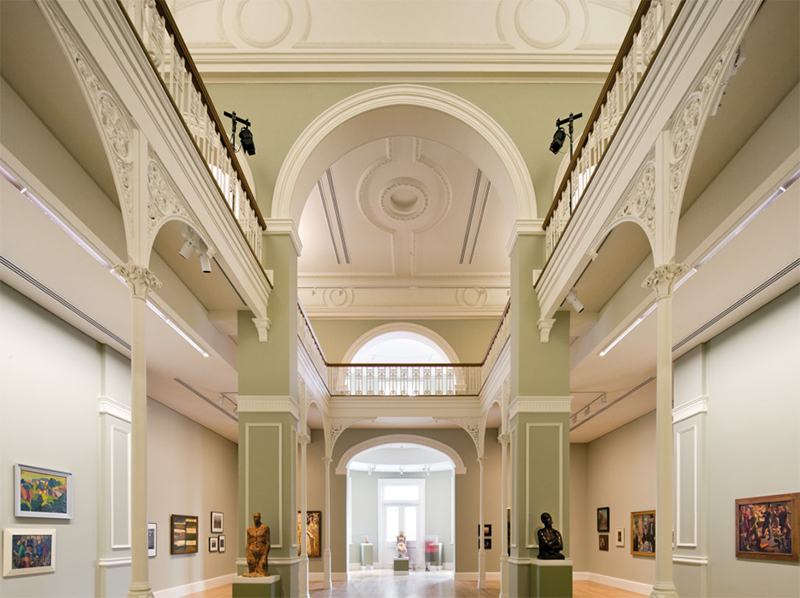 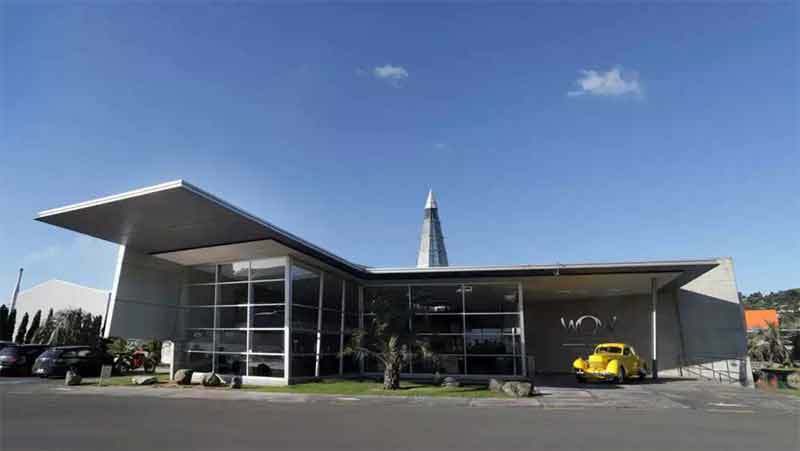 The adjacent antique car collection will be enjoyed by motoring enthusiasts. 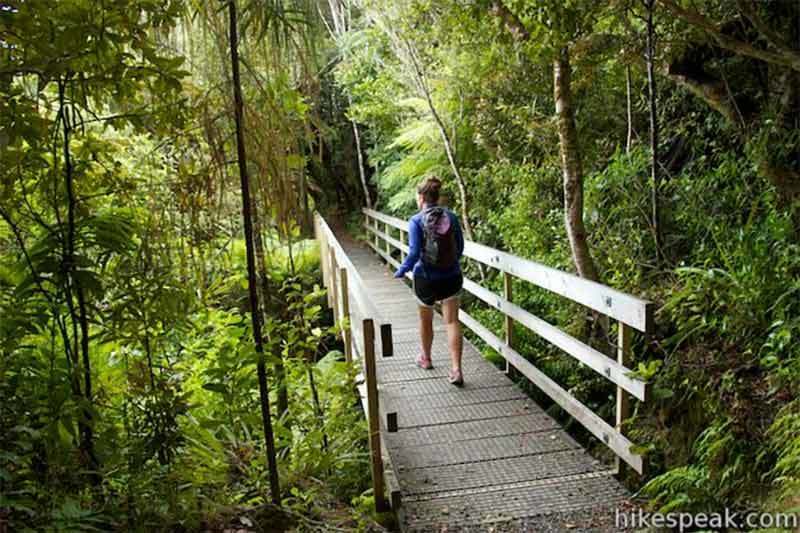 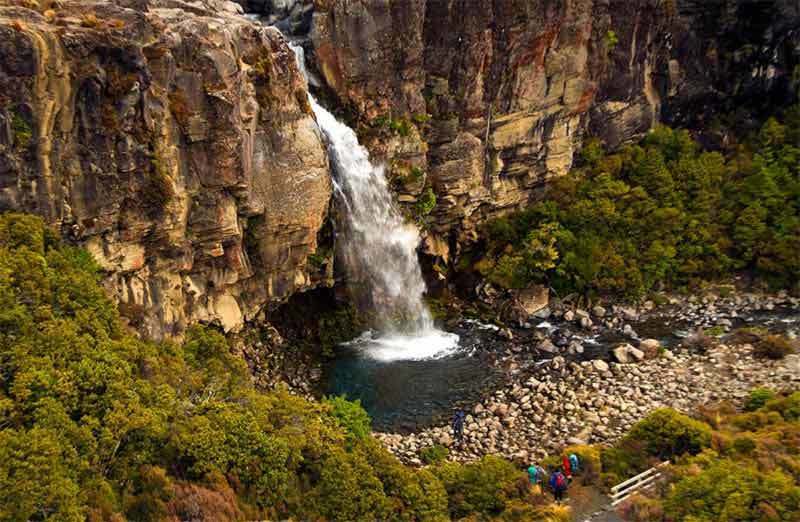 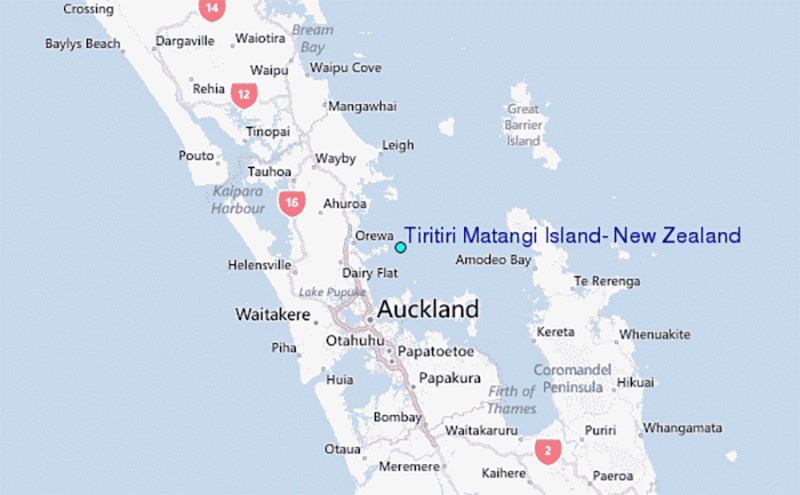 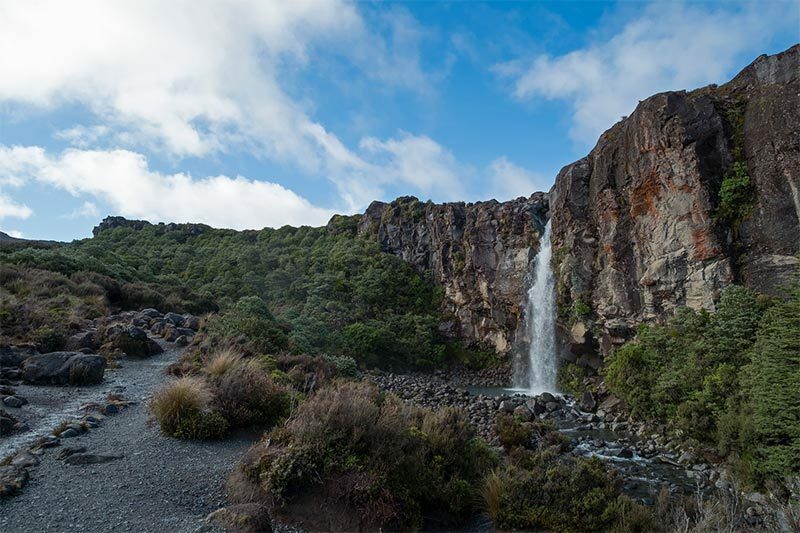 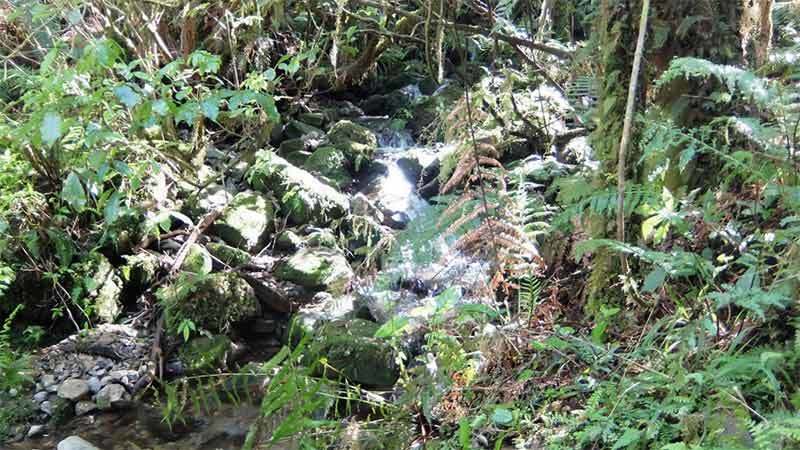 This is not only the smallest national park in New Zealand, it is also the most popular. 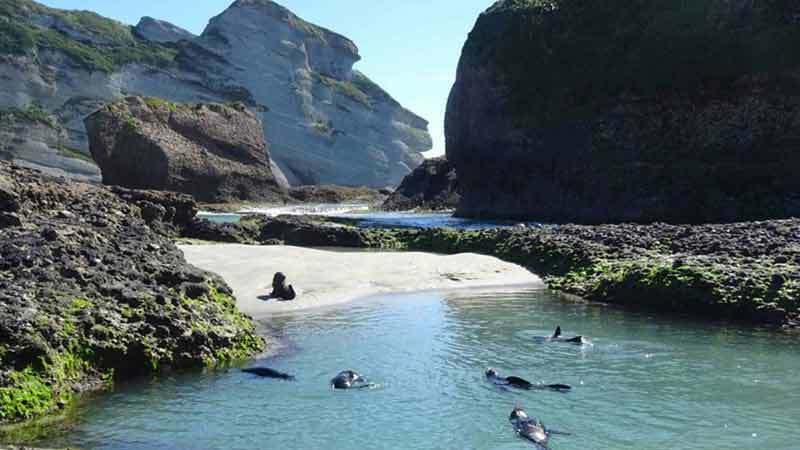 Golden sand beaches, crystal clear waters, superb forests, abundant bird and sea life draw visitors from all around the world. 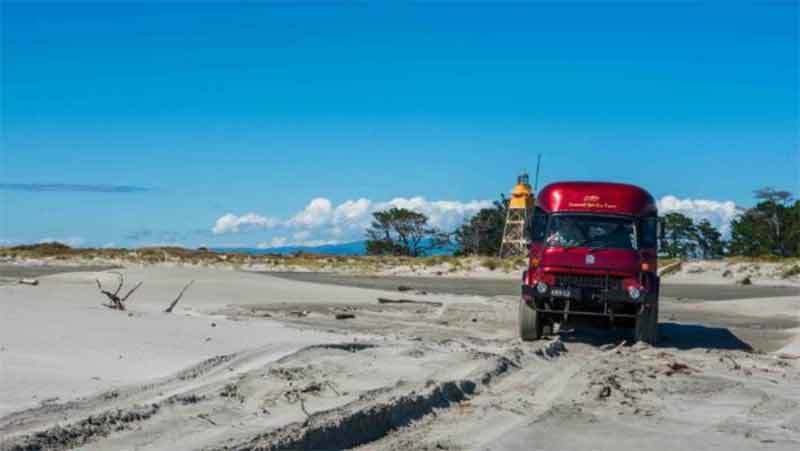 A favorite experience is to be dropped by water-taxi at a golden sand beach and to then walk along the beautiful coastline track to be picked up again at a pre-arranged pick-up point. 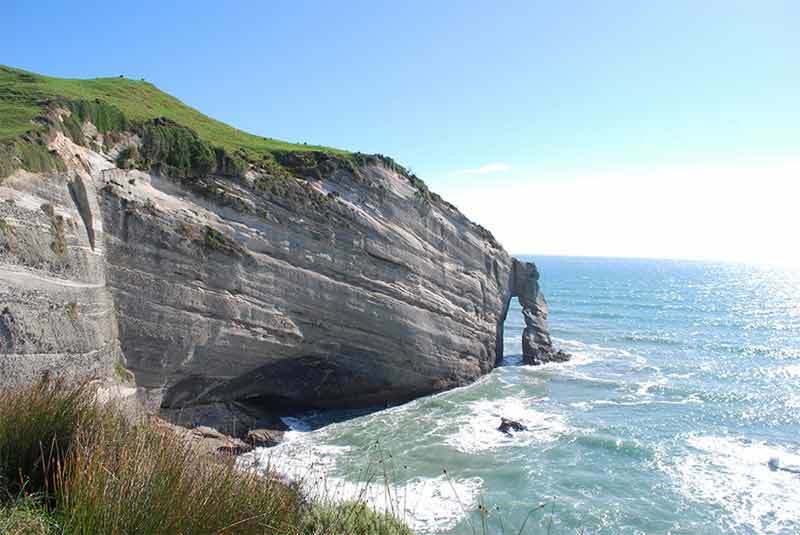 Cape Farewell is the northernmost point of the South Island, located on the coast at the start of Farewell Spit. 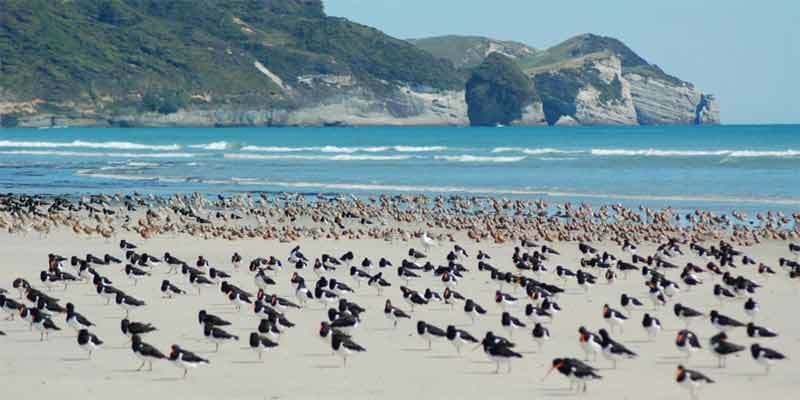 It provides homes for sea mammals and over 90 species of birds including up to 20,000 godwits, 30,000 knots plus curlews, whimbrels and turnstones. 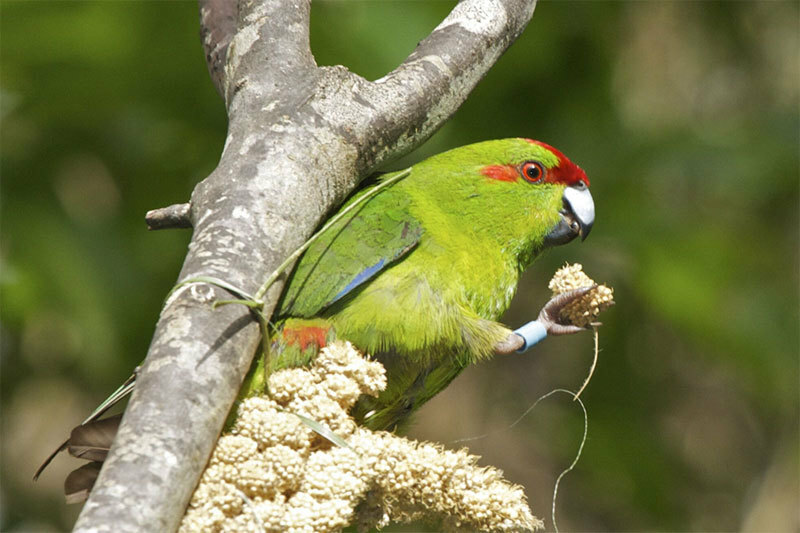 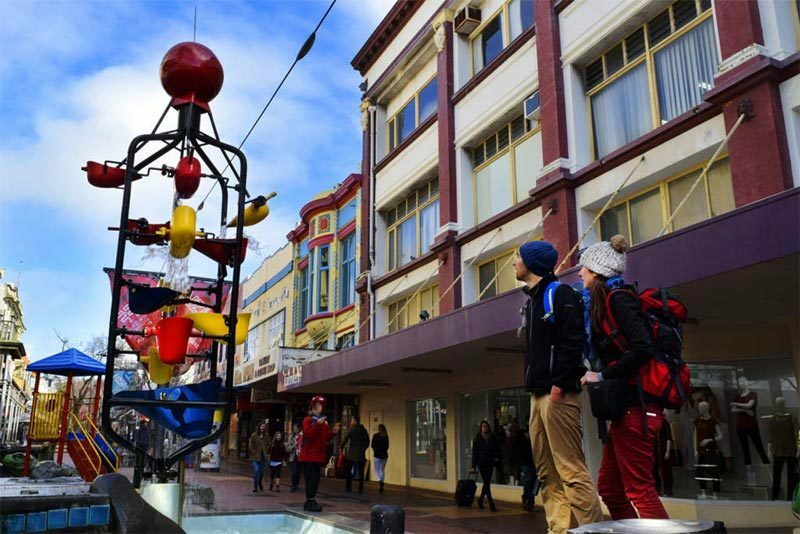 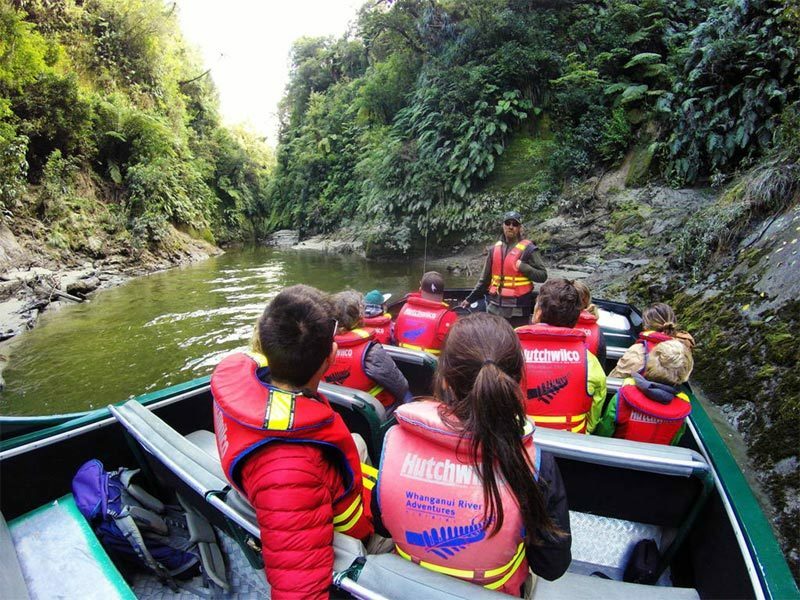 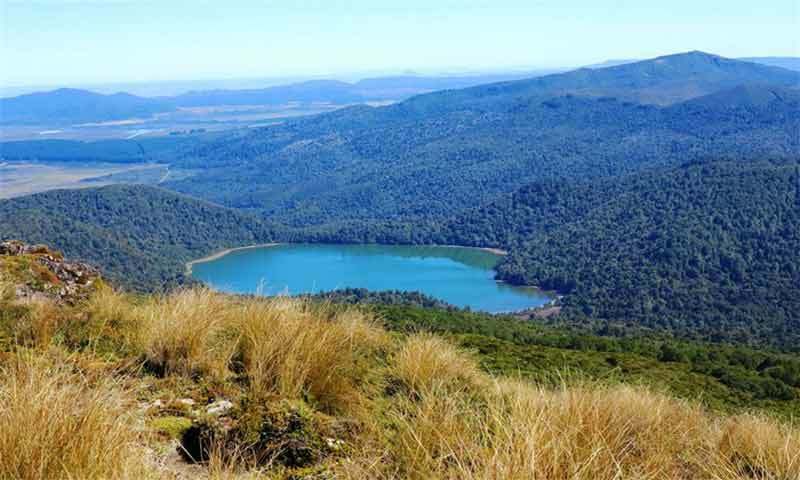 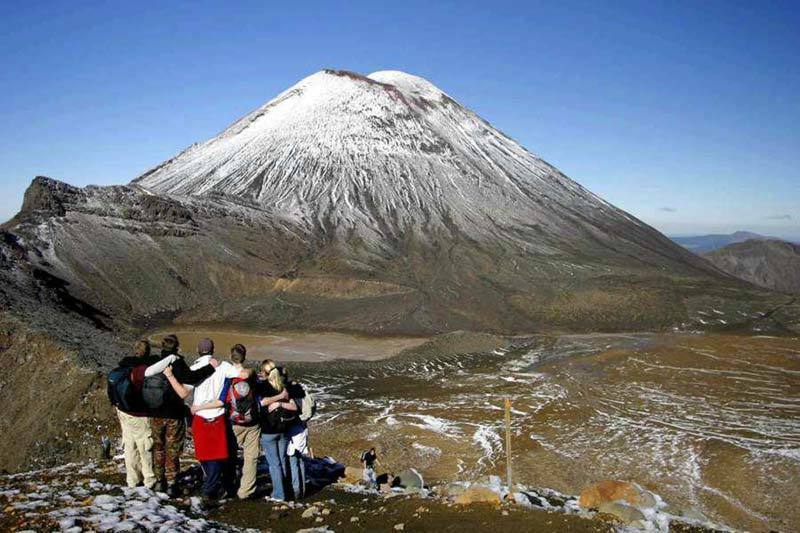 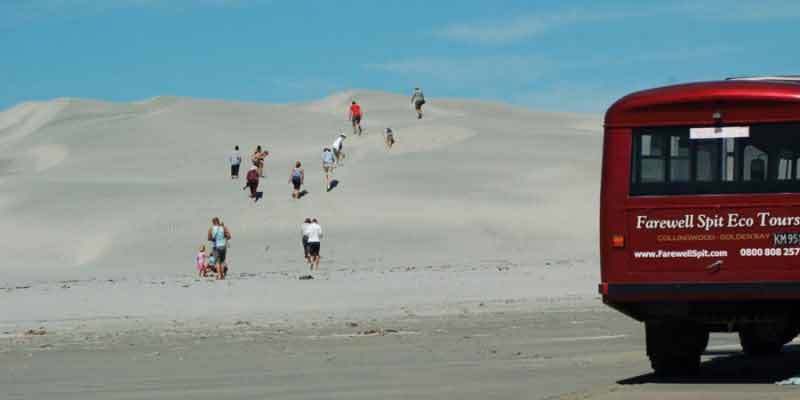 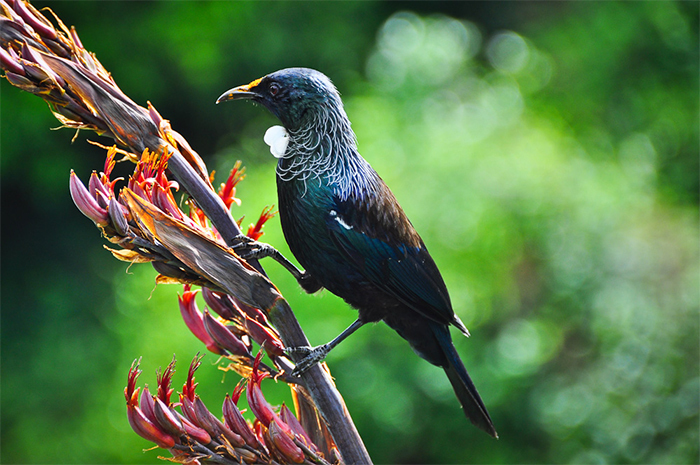 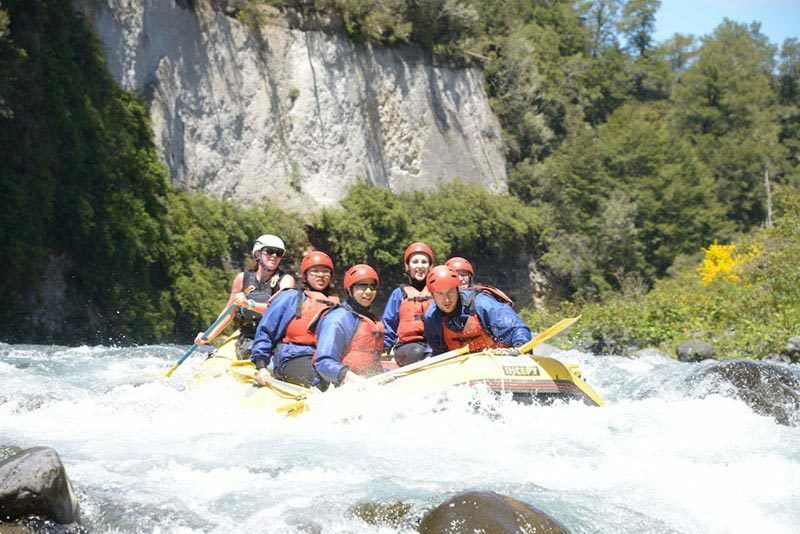 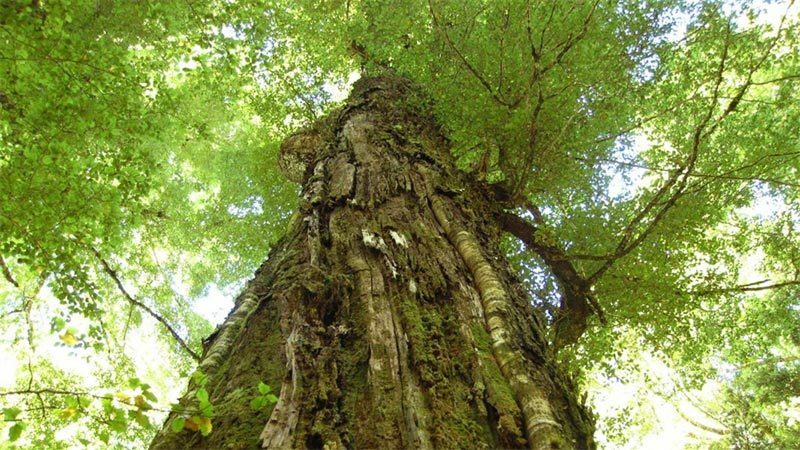 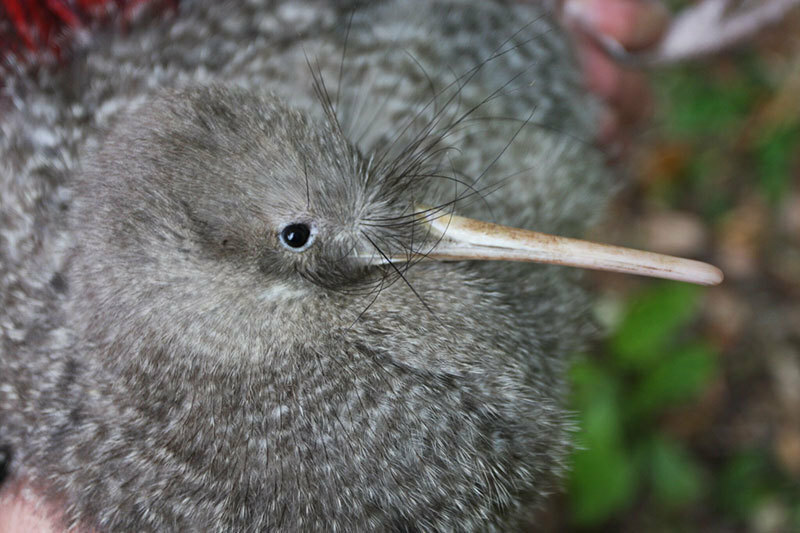 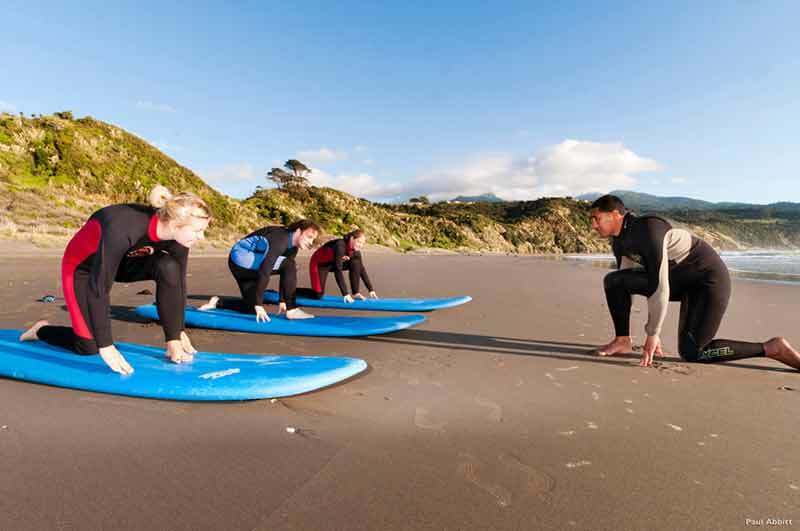 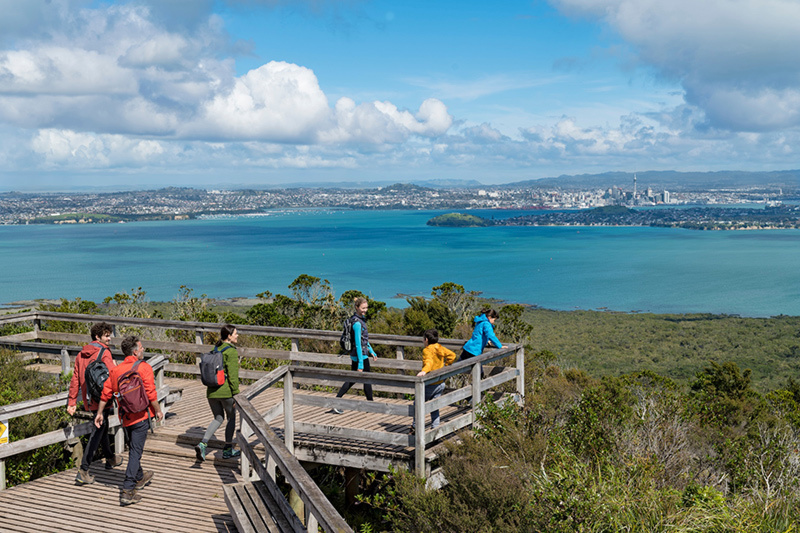 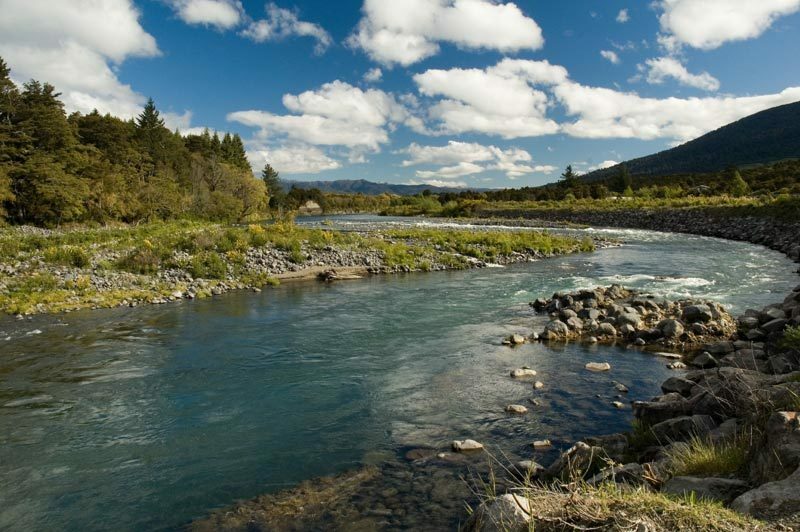 To make the most of this experience, New Zealand Vacations can arrange a one day 4WD guided tour from Motueka, the best way to learn about the history, the wildlife and ecology of the region from a qualified guide. 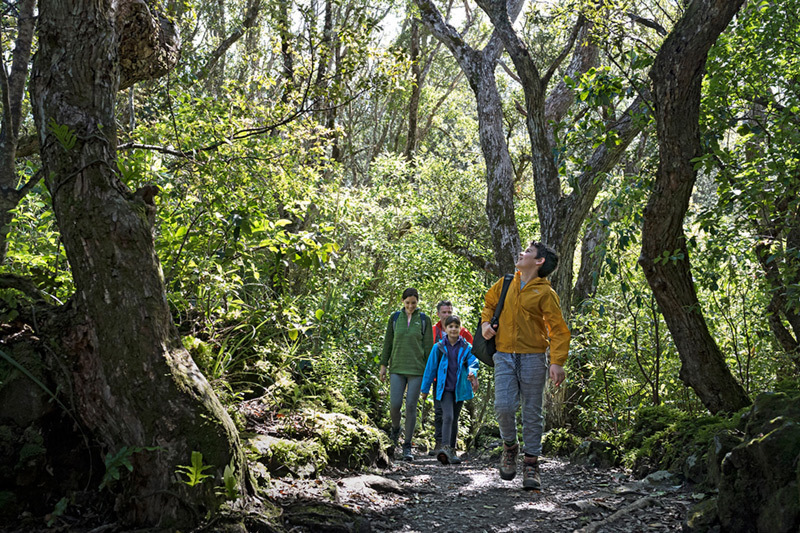 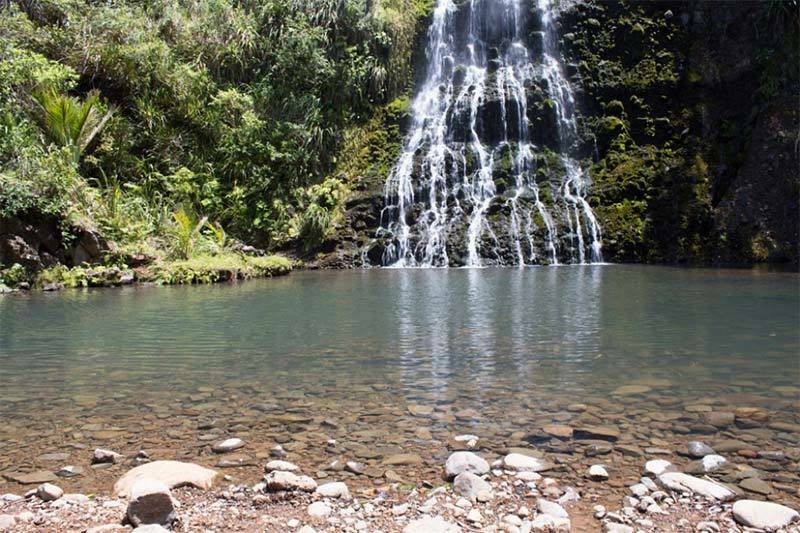 Bring cameras and binoculars to make the most of a visit to this nature-lover's paradise. 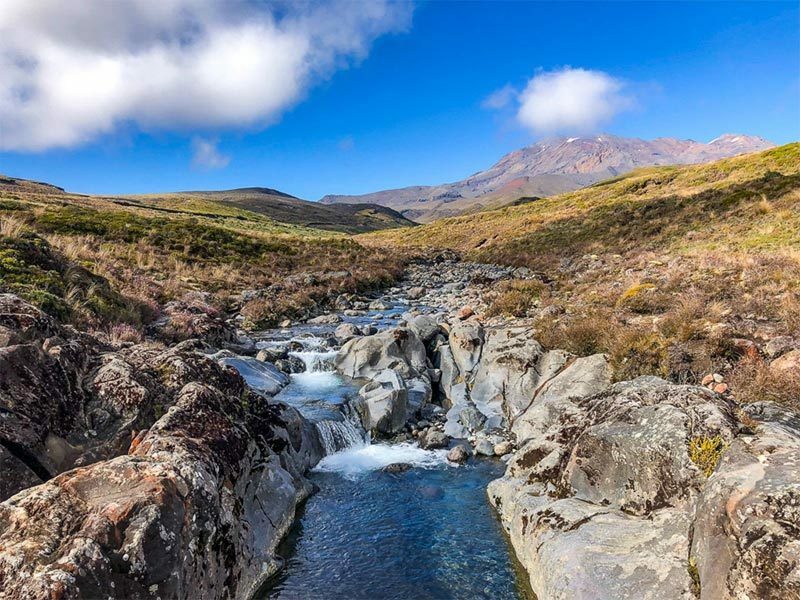 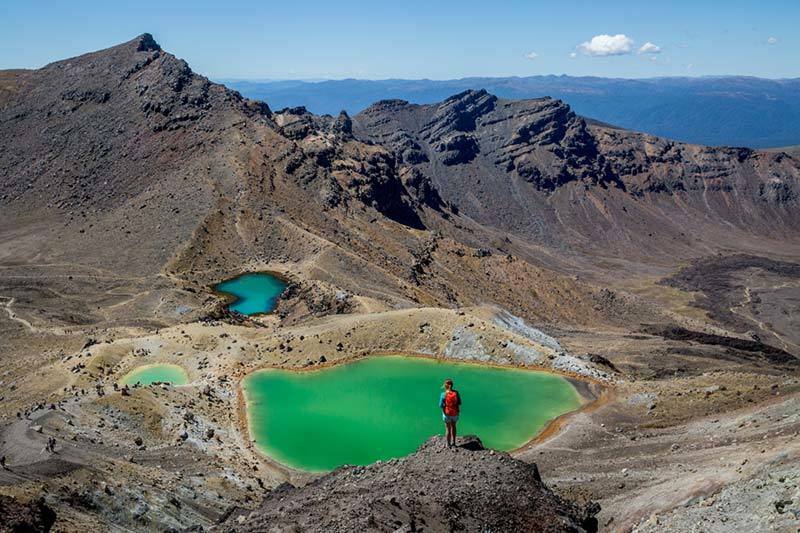 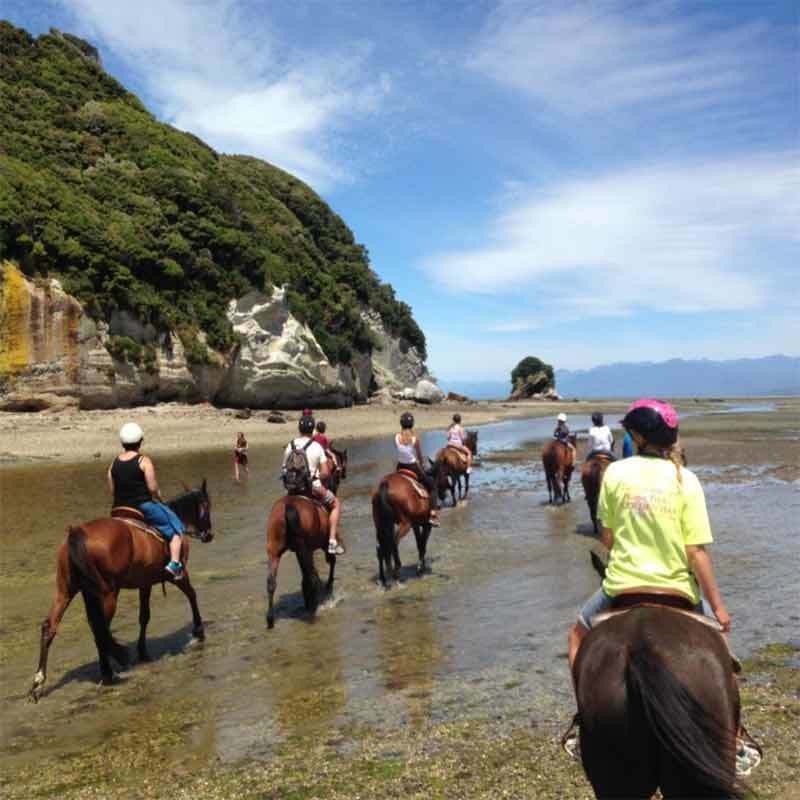 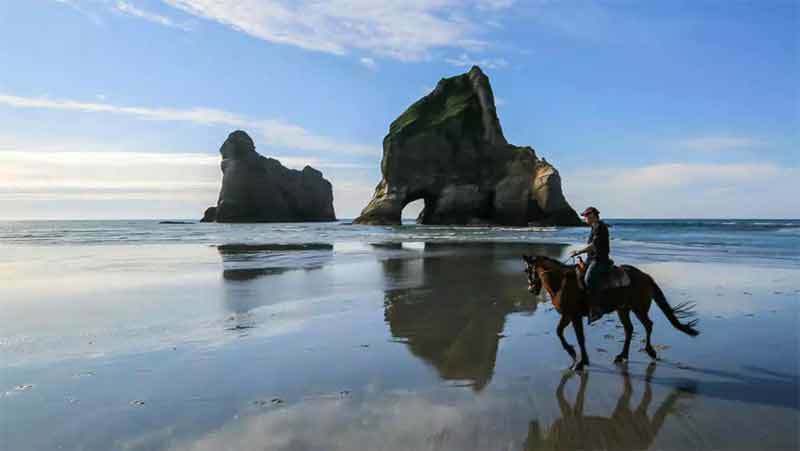 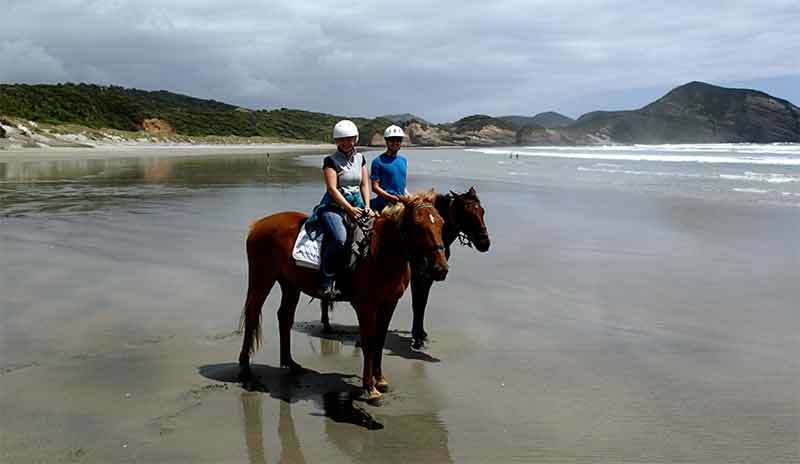 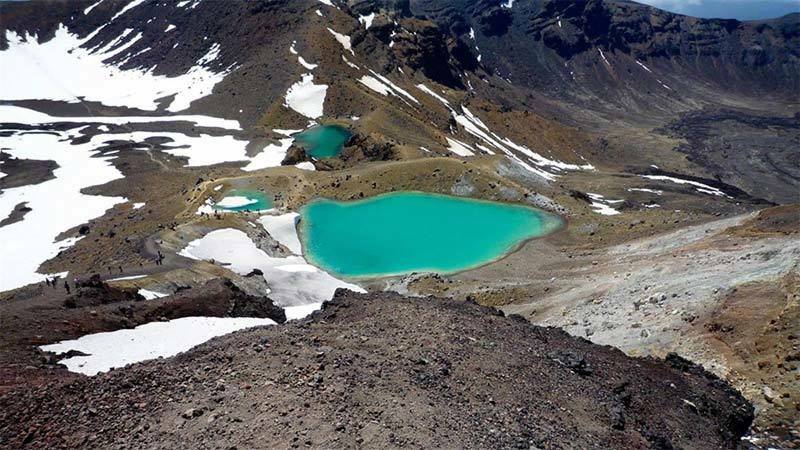 If you love horse riding, getting off the beaten trail and experiencing one of New Zealand's finest treks, this is the one for you - it has it all. 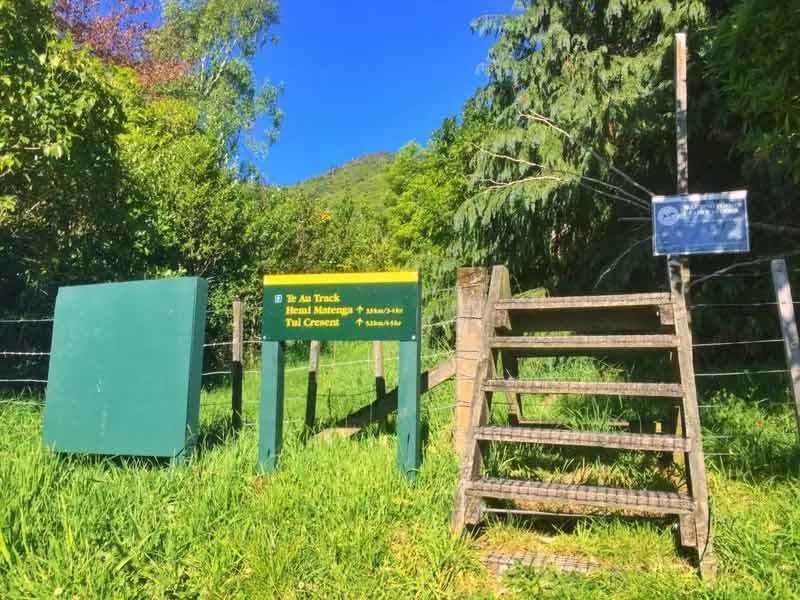 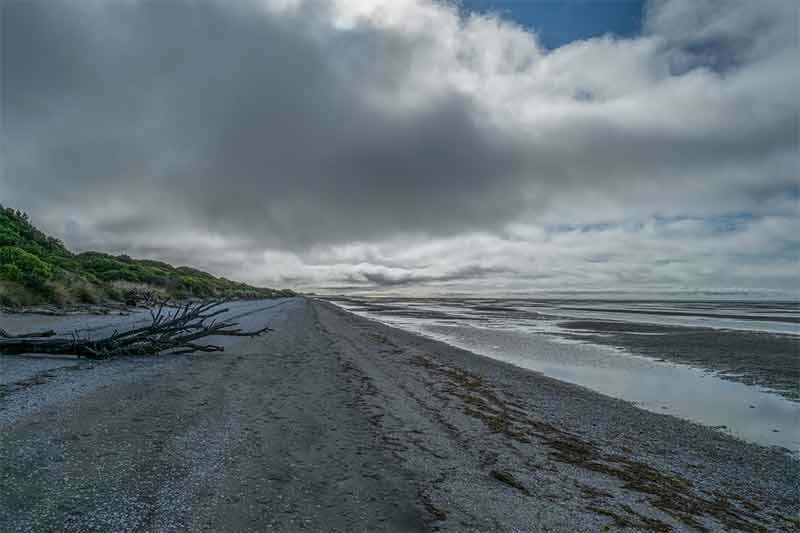 The departure point is a one hour drive from Motueka, some of it winding and the last mile before reaching the trek departure point at Puponga, a gravel road. 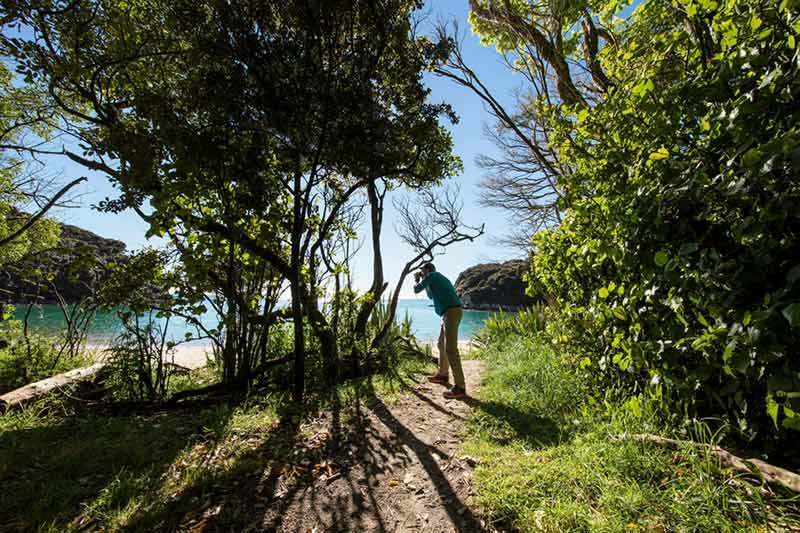 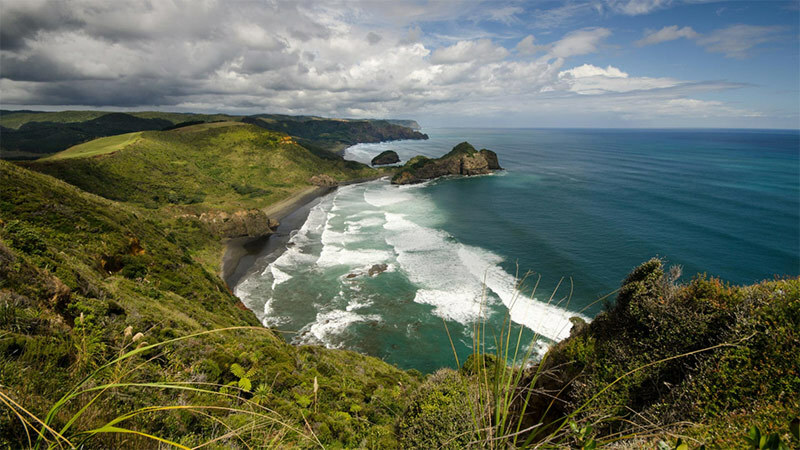 You start the trek with a meander over private forest and farmland making your way across beautiful Puponga Beach. 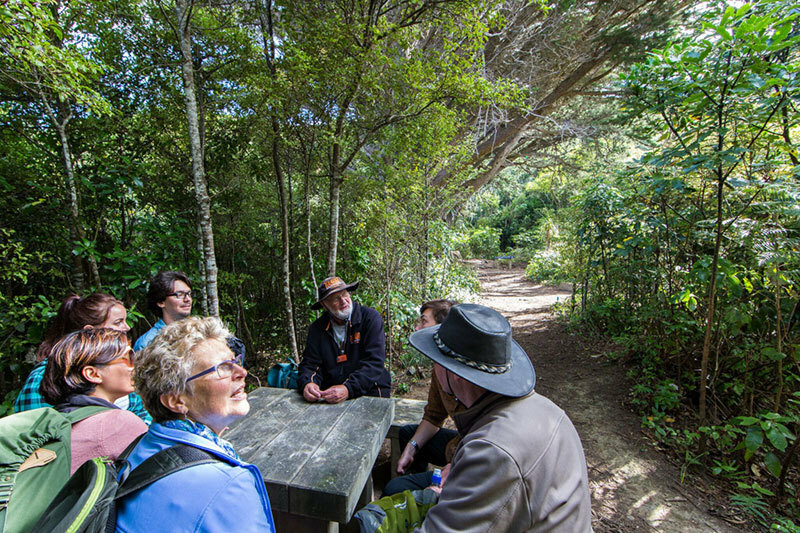 It then takes you through the Puponga Farm Park and climbs along the Old Man's Range where you have breathtaking views of your surroundings. 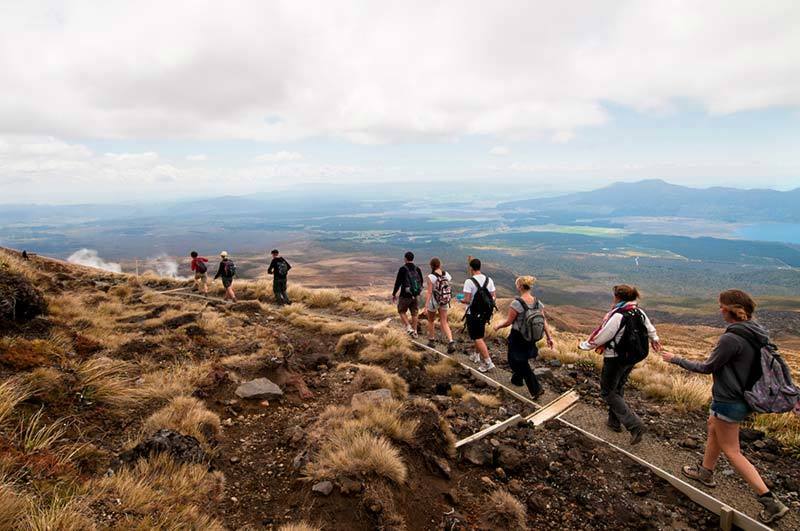 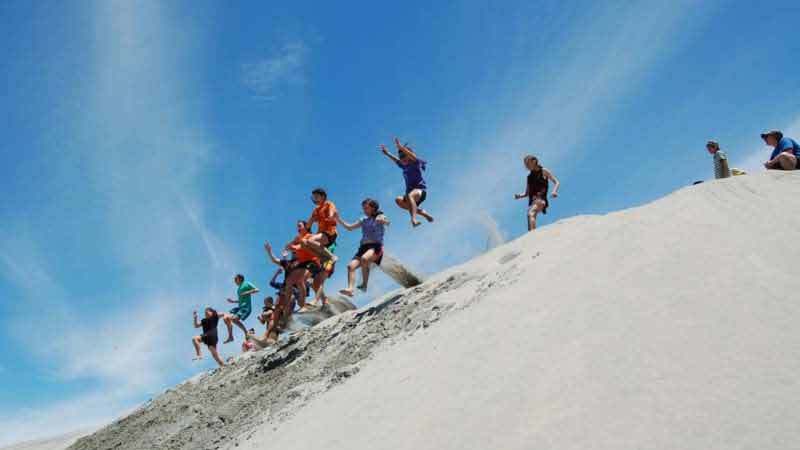 This trek has some steeper terrain and is suited more for teenagers and adults.